Where have we been? What have we done? The project is now six years and a bit old. We started (officially) on Feb 1st 2013, and the funding ended on Feb 1st 2014. I thought people might like to see how many sites we have worked on. I’m a little vague as do we count Verulamium as one site, or do we split it up (the Park, Gorhambury, Abbey Orchard etc.)? I make it 30 sites altogether. 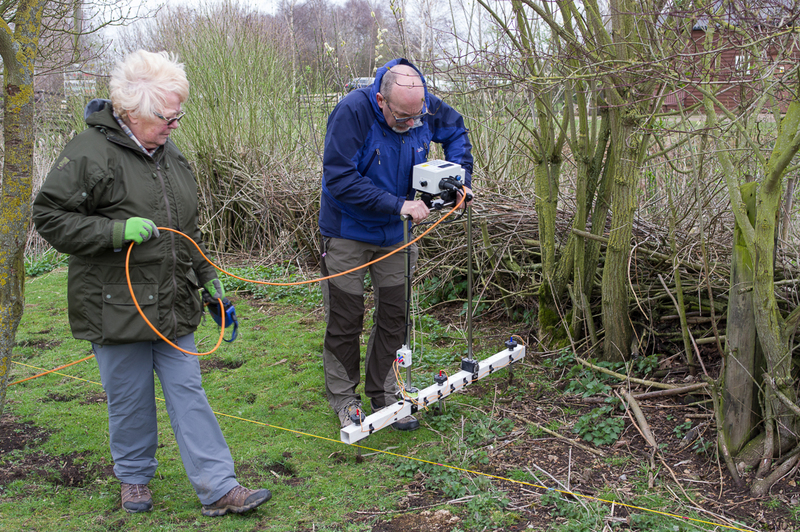 We have expanded from just magnetometry to regularly using mag, Earth Resistance and GPR, with occasional resistivity pseudosections and a little bit of magnetic susceptibility. I would like to thank everyone who comes and helps on the surveys, especially those who transport the gear around for me. 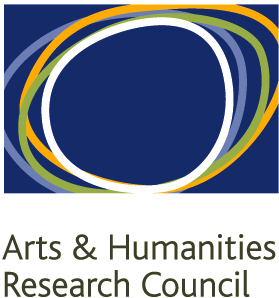 I would also like to thank the AHRC for funding the original project, the Institute of Archaeology, UCL, for allowing us to use their Earth Resistance meter and the dGPS, and SEAHA for the use of the GPR. The Institute also pays the annual fee for the GPR software I use. 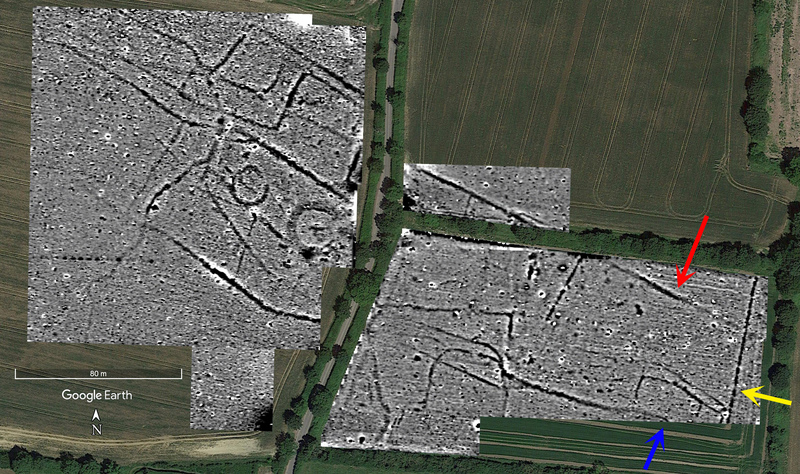 The two maps below show the sites in Hertfordshire that we have worked on, and all the sites that we have examined. Here is to the next six years! 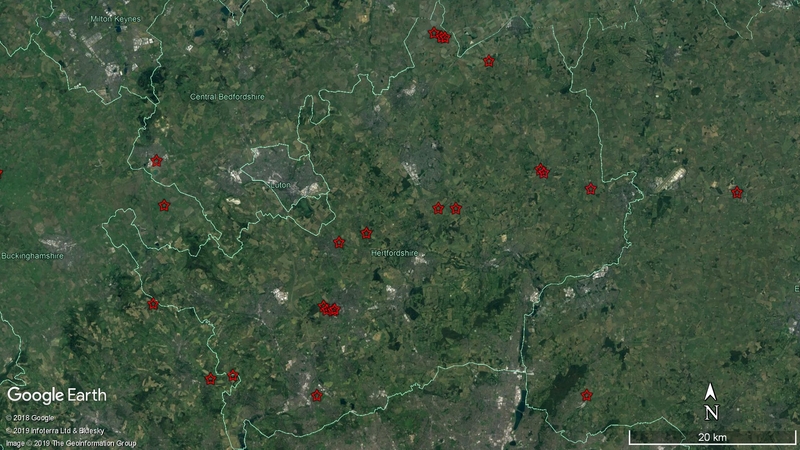 Figure 1: sites surveyed in Hertfordshire and immediate environs. Figure 2: sites surveyed by CAGG. 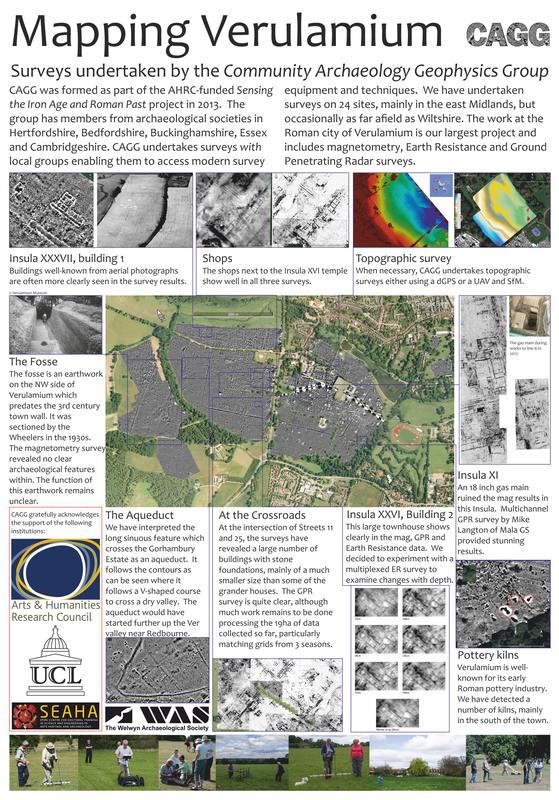 This entry was posted in general and tagged ahrc, birthday, CAGG, community archaeology, geophysical survey, SEAHA, ucl on April 4, 2019 by hertsgeosurvey. Archaeologists often have skeletons in their cupboards. Sometimes they are real skeletons. Sometimes, as here, they are unfinished jobs that they haven’t quite got around to completing. There are a few surveys we have undertaken that never quite got finished, and for which there are no blog posts (shock! horror!). 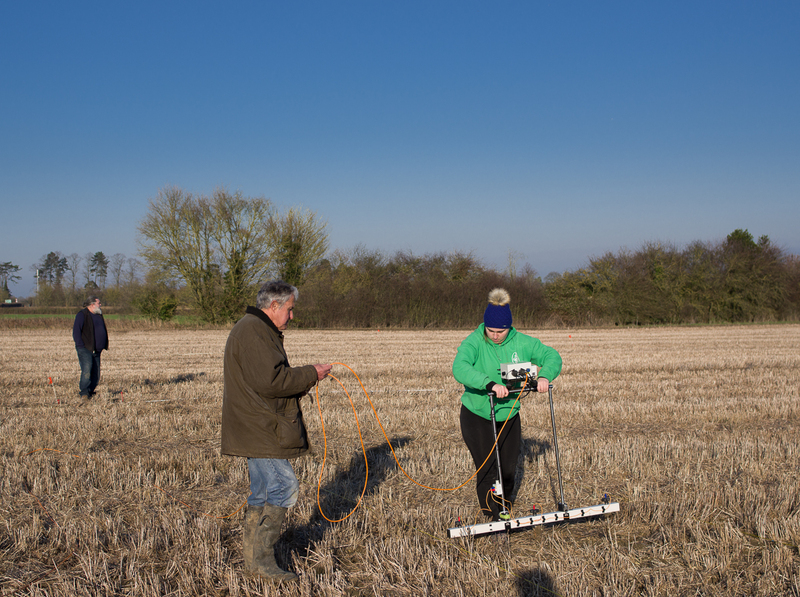 Way back when we got together with the Buckinghamshire Archaeological Society’s Active Archaeology Group and CVAHS to undertake some surveys at Hogshaw in Buckinghamshire. 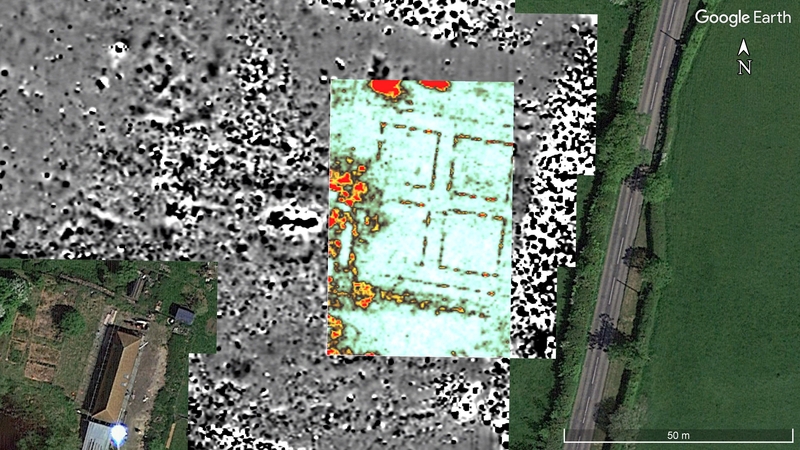 The AAG had undertaken an interesting research project on this site including topographic survey. We managed some mag (even though the mag was down to three probes) and some Earth Resistance survey (using our old system). The results were posted at the time. 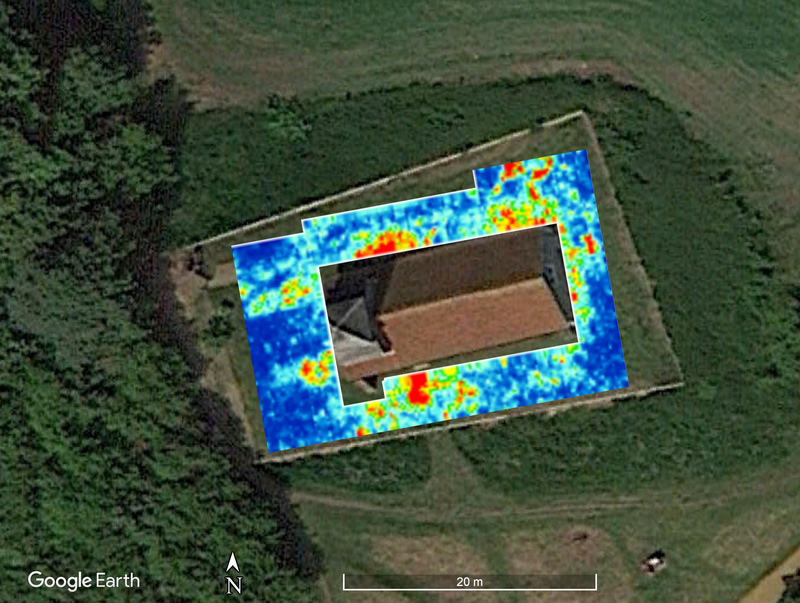 The magnetometry survey was mainly aimed at finishing the awkward bits around the edges, and an area to the south where the landowner kindly took down his fence so we could survey across it. The results are shown in Figure 1. Figure 1: the magnetometry data after the 2016 survey. At first sight the magnetic survey is rather busy and hard to interpret. This is not unusual in historic period sites where iron artefacts and fired bricks are relatively common. I have labelled the plot with some basic interpretative points (Fig. 2). Figure 2: magnetic data interpretation. The fence line is where the farmer kindly removed the fence so we could survey. It is fascinating to see that even when the fence has gone, we still detect the line of it. Iron rust etc. washes down and permeates the soil, I guess. The platform is a large flat area in the NW corner of the site. We do not know what it is for, and the mag does not help a great deal (neither did the Earth Resistance last time). Perhaps the most interesting feature that we detected last time is the four squares inside a square. This was quite a surprise. It looks very much like a formal garden. If it is a garden, there appears to be a line heading out westwards to an area of magnetic noise. I rather ignored that last time, but now I wonder if that is where the remains of the manor house were? It was abandoned in the 18th century. There are two lines of very noisy magnetic readings, one along the current road and one along the northern edge. I’d like to see how these relate to the topographic features. I think they line-up with the banks, and could be lines of brick rubble. Unfortunately, the LiDAR data for this area does not cover the site, ending just under half a mile to the north (Fig. 3). Typical! 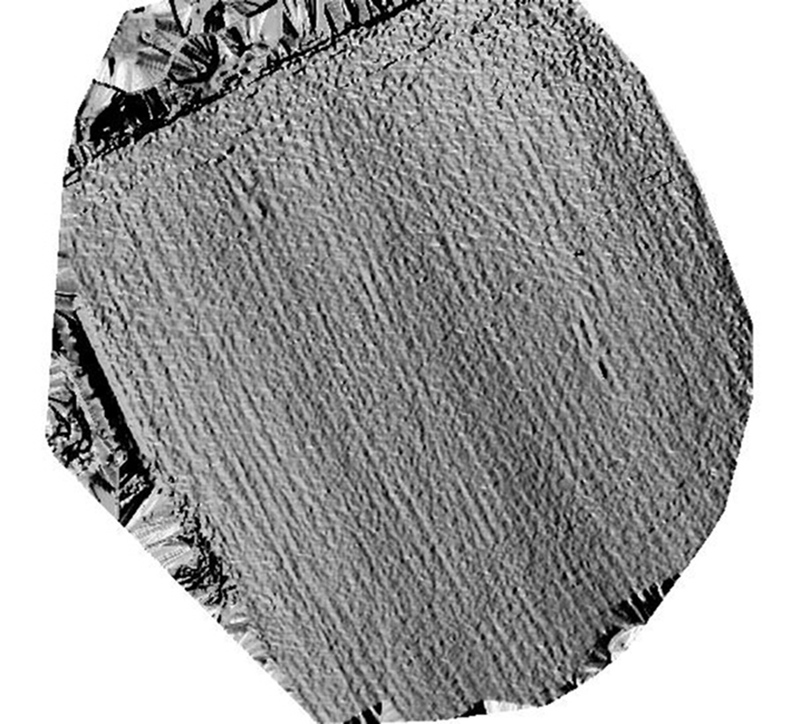 Figure 3: the LiDAR data overlain on a Google Earth satellite image. Three blocks of radar data were collected. We used SEAHA’s Mala GPR, and we thank them for the loan. The location of the three blocks are shown in Figure 4. Figure 4: Location of GPR blocks. The southern block was surveyed in 2016 because an excavation had found a couple of stone walls in this area, and it was suggested this might be the location of the lost chapel. Figure 5 shows the top nine time slices (note that north is downwards in these images). Figure 5: time slices from the southern block. The first time slice shows the road nicely. Also helps build confidence when the method detects the absolutely obvious! By about the fourth slice (second row, leftmost image) the road is largely gone but there are two parallel lines running north south. Could these be our missing walls? Perhaps, but I suspect they are compacted earth either side of the fence which the farmer took down for us. The area of high amplitude reflections in the bottom-right corner (north-west) is the area of wet mud around the various temporary structures that were moved. All in all, a rather disappointing result. The platform block was an attempt to see if we could work out the function of the platform in the NW corner of the site. Figure 6 shows nine time slices. Figure 6: time slices from the platform block. Again, note north! There is a vague hint of something in slice 7 (third row, first image) that might be rectangular, but it is quite low down in the sequence, and a bit amorphous. Looking at the radargrams (the original vertical slices), I cannot see anything particularly wall-like. I suspect that what little radar energy has been reflected has been greatly emphasised in these plots creating the illusion of something. Figure 7 shows slice 7 in context. Figure 7: platform block, slice 7, in context. Last, but not least, is the “garden” block (Fig. 8). Figure 8: six GPR time slices over the “garden” block. 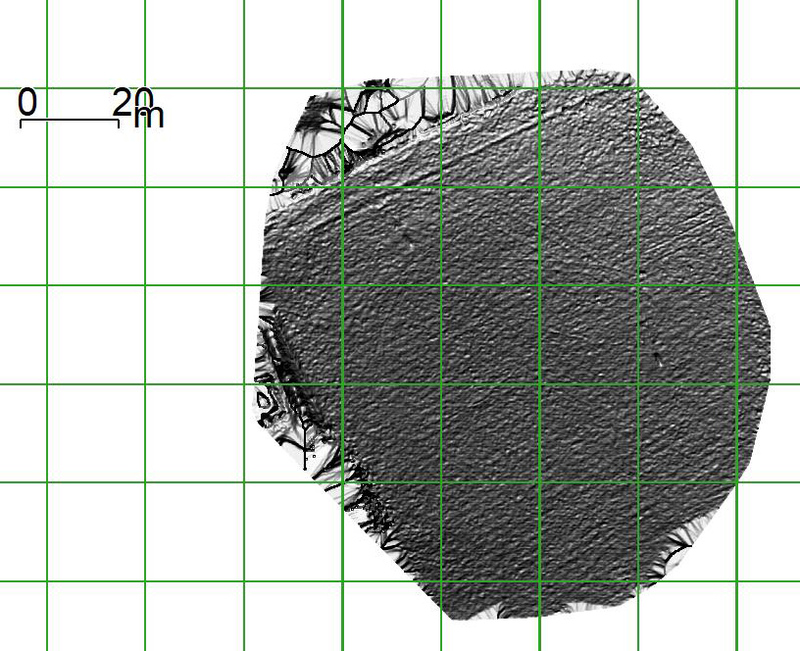 In slice 1 (top left), the results just reflect the uneven surface. In slice 2 we can start to see something, but it is in slices 3 and 4 that we can see the “garden” feature quite clearly. The whole feature is about 36m across with the internal square about 12m by 12m. To the south there appears another strong linear reflection. Maybe a road to the house? Figure 9 shows slice 3 in context. 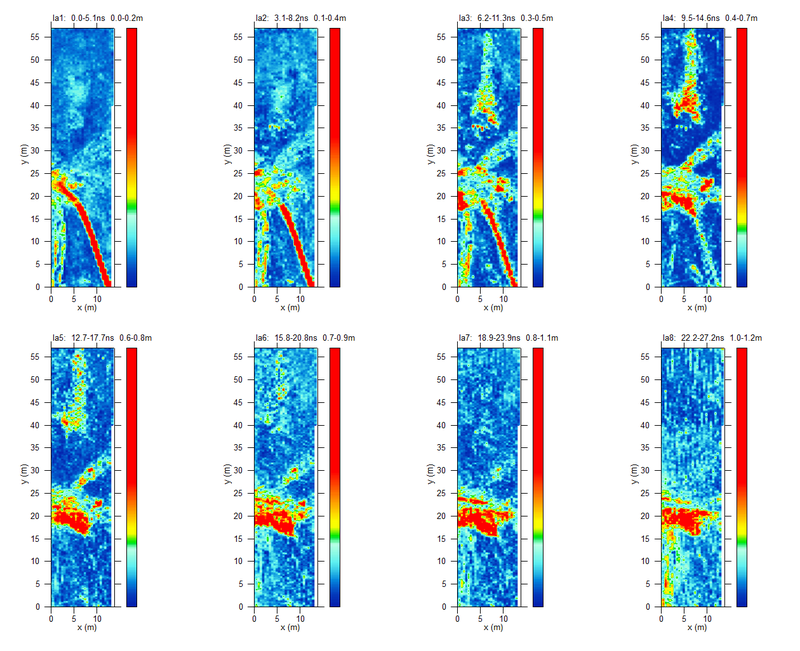 I’m glad to say that the mag and GPR data match very closely. The edging around the features must be something both magnetic and that reflects radar data. Brick is one possibility, and some form of igneous rock is another. Figure 9: the “garden” block, slice 6 in context. Figure 10: the gardens at Hatfield House. Many thanks to everyone who helped on the four days of survey, especially to the very helpful landowner. Also many thanks to Anne Rowe for commenting on the “garden” feature and sending me some very useful information. Hogshaw still has some secrets to give up! 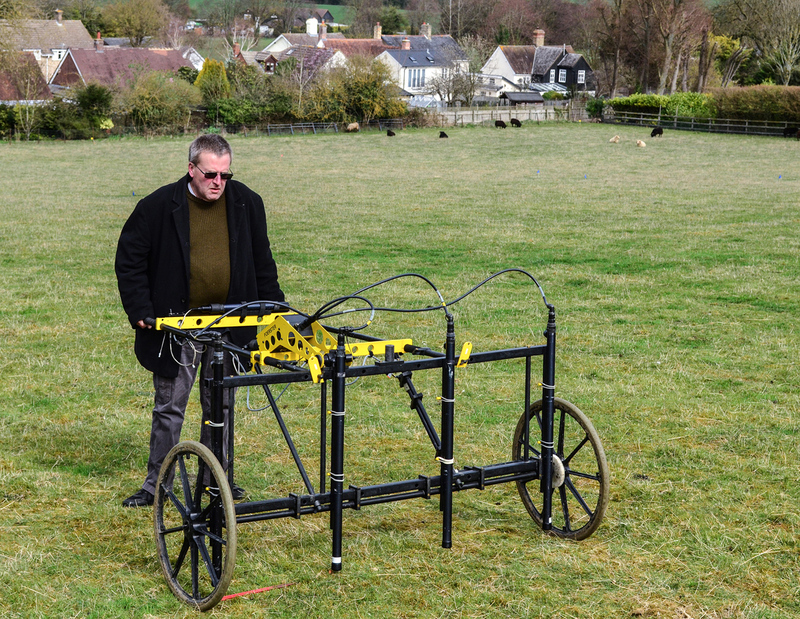 This entry was posted in Hogshaw and tagged Active Archaeology Group, ahrc, archaeology, Buckinghamshire, Buckinghamshire Archaeological Society, CAGG, community archaeology, earth resistance survey, garden, geophysical survey, GPR survey, Ground Penetrating Radar, Hatfield, Hogshaw, magnetometry survey, SEAHA, ucl on April 3, 2019 by hertsgeosurvey. The small chapel of St Mary Magdalene lies in the south of Buckinghamshire, not far from Windsor and Eton. Now only used for occasional services, it is looked after by the Friends of Friendless Churches. It is a lovely little chapel, and well worth a visit (Fig. 1). Figure 1: the chapel of St Mary Magdelene. 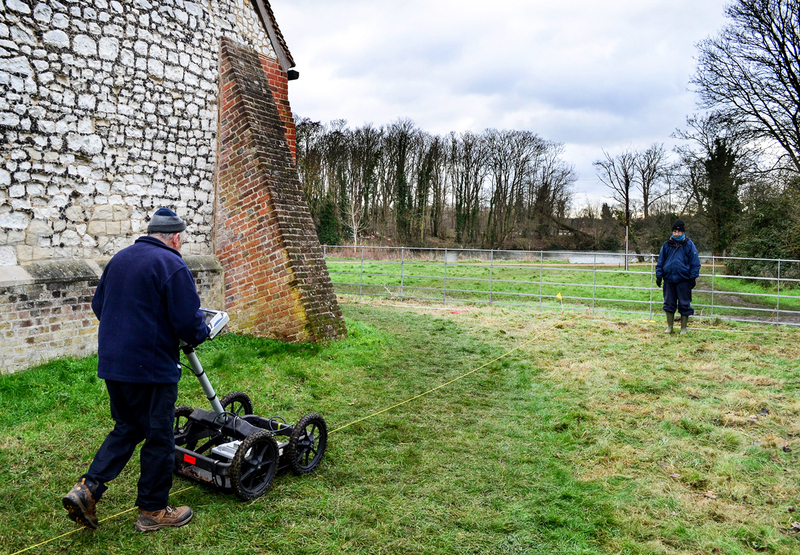 We were contacted via the Buckinghamshire Archaeological Society’s Active Archaeology Group to see if we would undertake a geophysical survey around the chapel. The question was deceptively simple: are there graves around the church? The reason for the question is partly because, usually, ‘chapels of ease’ were not used for burial, and partly because the nearness of the water table makes digging deep holes problematic. Although the site is a long way out of our usual area, we agreed to try and see what we could find. burials are notoriously difficult to detect at the best of times. They aren’t very big, and usually the same soil that came out of the hole goes back in again pretty quickly. There is, therefore, relatively little contrast between the grave fill and the surrounding soil. Small areas are difficult to interpret. 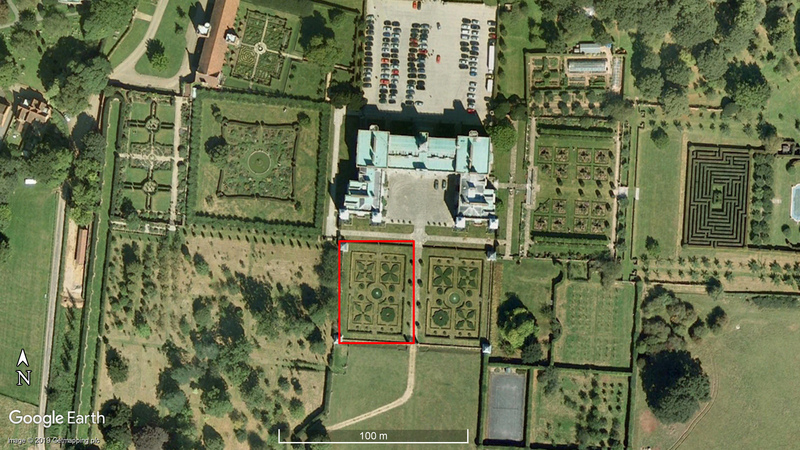 The whole churchyard is only 0.07ha (less than two 20x20m grid squares), and you have to subtract the footprint of the church itself and the path. 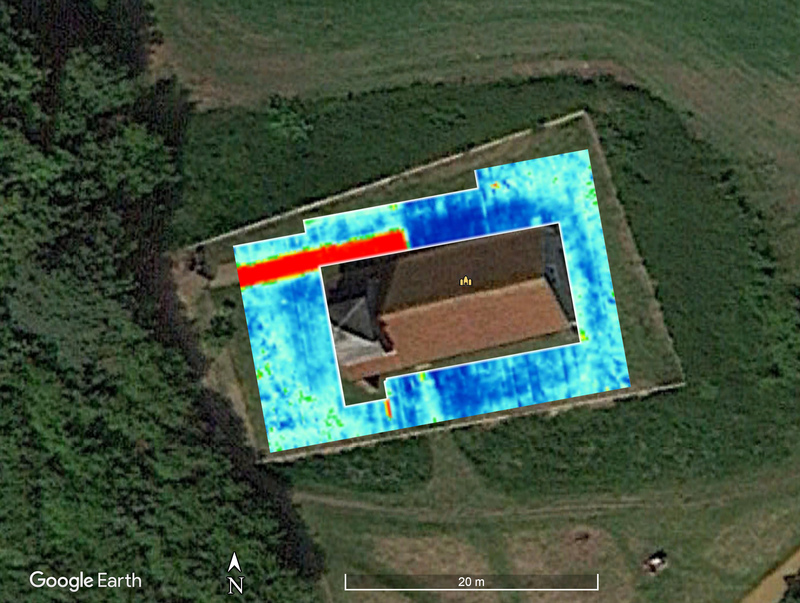 GPR surveys near standing buildings suffer from airwaves. Although the antennae are shielded, some of the radar signal will ‘leak’ and will bounce off nearby buildings etc. Airwaves can be seen in the data as having hyperbolas with a much flatter profile than the usual point sources in the ground such as rocks or walls. 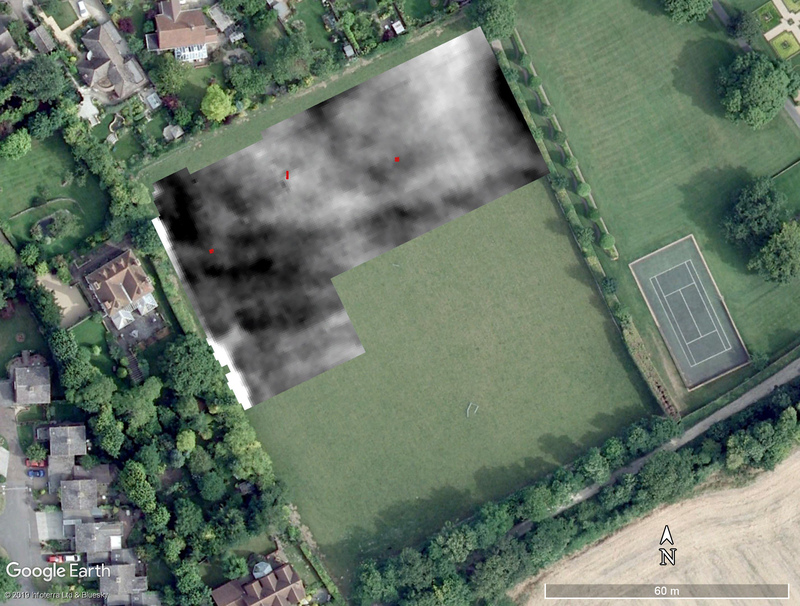 Given the very small size of the area, and the surrounding metal fence, magnetometry survey was going to be pointless. 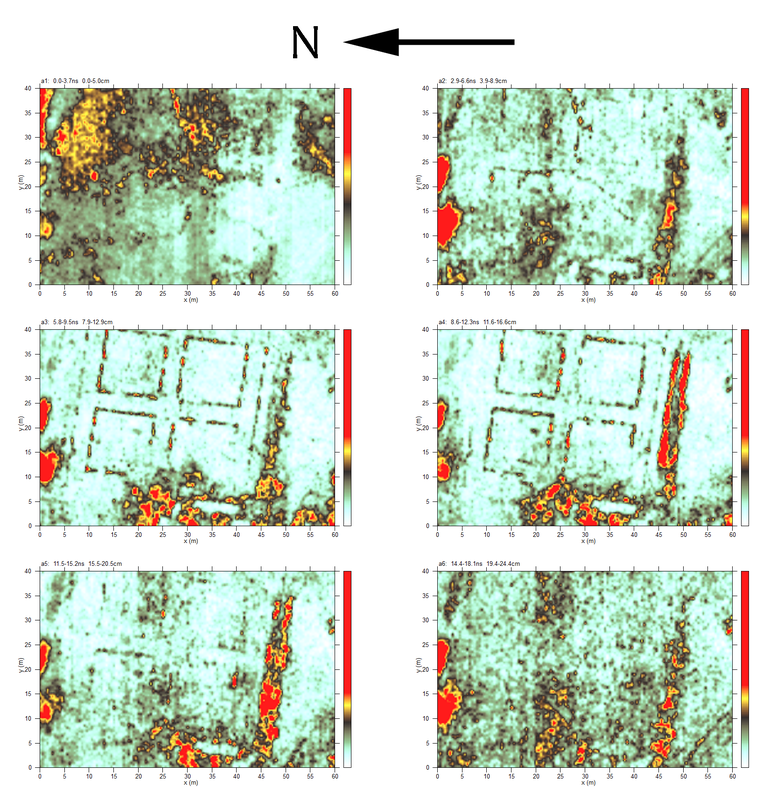 Often, the best method for finding graves is GPR, and so that was our primary method (Fig. 2). Due to the building, and the odd shape of the church yard, we had to do the survey in six small blocks at 25cm intervals. Although it would have been easier to do the survey east-west, if we are trying to find graves working north-south would be more effective allowing the transects to cut across the grave rather than along it. Lastly, we decided to try the multi-depth Earth Resistance survey, aka ‘the beast‘ (Fig. 3). Figure 2: the GPR in action at Bovenay. Photo: © Mike Smith. Figure 3: the ‘beast’ in action at Bovenay. We all headed off to Bucks on a cold and slightly damp Sunday at the end of January (yes, I know this posting is late!) and we were assisted by members of the Bucks ASAAG. Both GPR and resistance surveys were awkward due to the small space we had available. The site is also very busy with walkers, cyclists and people enjoying their Sunday. The idea of “the beast” is that the depth to which an Earth Resistance survey will measure is proportional to the distance between the mobile probes on the frame. The two remote probes have to be at least 45m away! Each time the machine is moved, it takes seven readings: one between two probes 25cm apart, one at 50cm, 75cm, 100cm, 125cm and 150cm. Yes, that makes six. Just for comparison, the seventh measurement is taken using a “Wenner array”. This simply means that instead of using the two remote probes at the end of the cable, it uses the two outer probes on the frame to pass the current, and the two inner probes to take the reading. This is an older method for laying out probes that has generally been abandoned in archaeology, although it can be useful in circumstances when having remote probes at the end of the long cable is impossible. The results for all seven readings are shown in Figure 4. Figure 4 looks a little odd because the satellite that took that image was clearly passing overhead a little to the south-east. 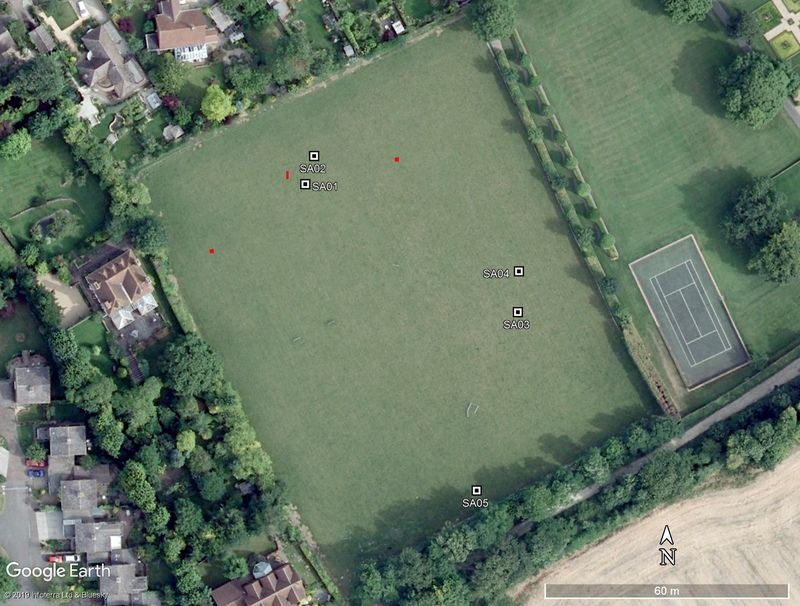 It is, however, the best one available on Google Earth Pro. Comparing the various surveys at different depths, there is very little difference between them. Unsurprisingly, near the walls are areas of high resistance, possibly due to the foundations. The path was a pain. One problem was a number of ‘spikes’ in the data. These were probably caused by the rabbit holes: a hole with air is going to be high resistance (in fact the current passes through the soil around the hole). I worry slightly that processing those out may also have processed out the graves, but somehow I doubt it. It doesn’t look like we detected any graves with this method. 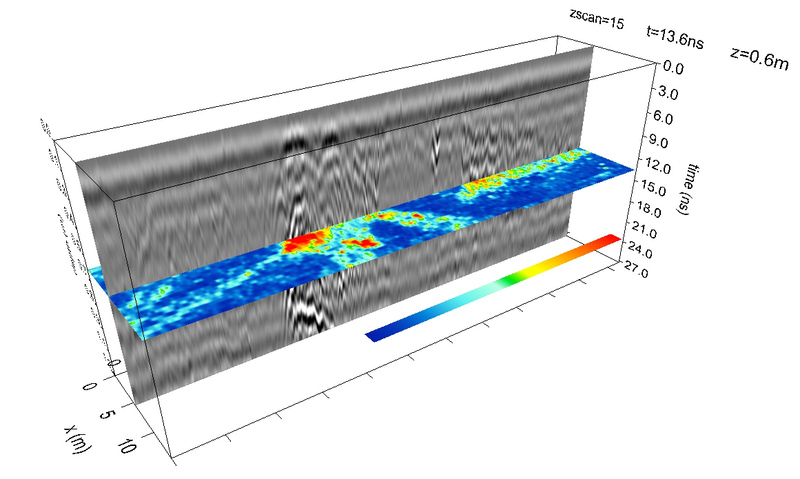 The GPR survey was processed using the package GPR Slice. Figure 5 shows all the slices from the survey. These were processed using 2.92ns slices with a slight over-lap between them. Figure 5: the time slices from Bovenay. The bright red line in the first slice is the path to the north entrance of the chapel. If you look at the image on Google Earth, one can see the south entrance too as a lighter blue line (Fig. 6). Not an Earth-shattering observation, but it is always encouraging when one can see the obvious! Figure 6: GPR time slice 1. Figure 7: GPR time slice 11. If we look at the radar data in 3D, we can see these strong reflections low down curving-up towards the edge of the survey (Figure 8). You can see those strong reflections intersecting with the red line in the time slice (labelled ‘air waves’). Figure 8: 3D image of the radar data. To understand what is happening, we need to go back to GPR basics. What is happening when we do a survey? The transmitting antenna sends out a radar pulse. Due to the shielding, most of this goes down into the ground, but some will leak out and bounce around like echos. The receiving antenna measures the returning radar waves. It records two things: the strength of the signal (amplitude) and the time since the pulse was transmitted. The software plots the strength of the return signal in shades of grey. Strong returns are plotted in black and white, and weaker returns in mid-greys. These are plotted as a single vertical band below the centre point of the antenna. The radargram one looks at on the screen are all these vertical bands added together to give the overall image. Because the longer the time between the pulse and the return, the weaker the signal will be, we apply a ‘gain curve’ to the data. This is just a multiplication factor so that the deep returns are visible compared to the shallow ones. As we push the GPR towards a wall, some of the signal will bounce off that wall. At first, the distance between us and the wall is relatively large, so the reflection will be plotted by the software low down the profile. As we get closer, the time taken for the signal to bounce off the wall gets less, and so the reflection is plotted higher up the profile. As a result, the signals bouncing off the wall will show as a gently rising curve. Radar waves travelling through the air travel at the speed of light. Radar travelling through the soil is much slower. As a result, curves in our data which are quite steep are the result of a reflection from something in the soil. Very gentle curves are “air waves” and are the result of the radar bouncing off buildings, or even the underside of tree canopies. To cut a long story short, the strong, deep reflections are airwaves caused by the radar bouncing off the walls of the chapel. Figure 9 shows the southern radargram from Figure 8 with some of the relevant reflections indicated. Figure 9: Radargram 7028 at 12m east with some reflections marked (see text). In Figure 9 the airwave has been marked in red. See how it is a gentle curve across the radargram. A more normal hyperbola from a point source is indicated in purple. The green line near the surface represents the compacted soil outside the south door. Notice how there are bands of strong reflections below it. These are like echos. There is another, deeper, surface marked in yellow. I’m not sure what this it, perhaps an earlier entrance path? If we look at time slice 5, we can see this area of high reflections outside the south entrance to the chapel (Fig. 10). Figure 10: GPR time slice 5. Archaeologists, (me included! ), dislike looking at radargrams as they find them confusing (they are). Often one will see reports with only the time slices presented. One thing I have learnt from Larry Conyers, however, is that it is vital to look at both the time slices and the radargrams if one wants to understand in detail what is happening. Although in general I am not a fan of pseudo-3D representations of things (don’t get me started on the invention of the Devil, the 3D pie-chart! 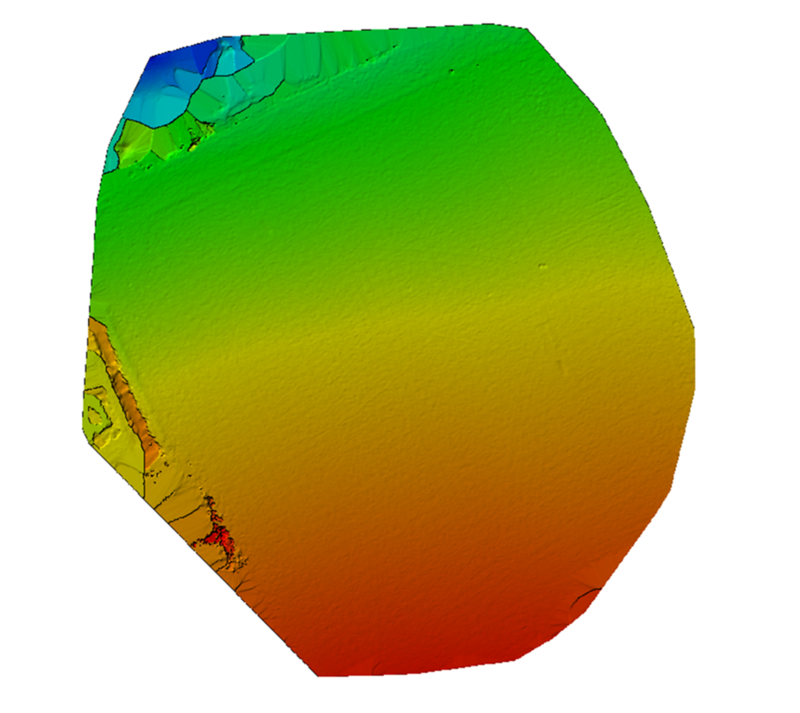 ), the 3D plots in GPR Slice do help work out what is going on. So the million dollar question is: have we found any graves? The short answer is: none that I can see. The long answer is, sadly, that that does not mean there are no graves. Geophysics does not detect everything, as much as we would like it to. Also, I need to spend some more time going through the radargrams and trying to see if there are graves which show in the vertical radargrams but do not show in the horizontal time slices. Later this year I plan to spend some time with a friend in the US who does this sort of thing all the time, having a look at the data from this site and a couple of others in the hopes I have missed something vital. Watch this space! 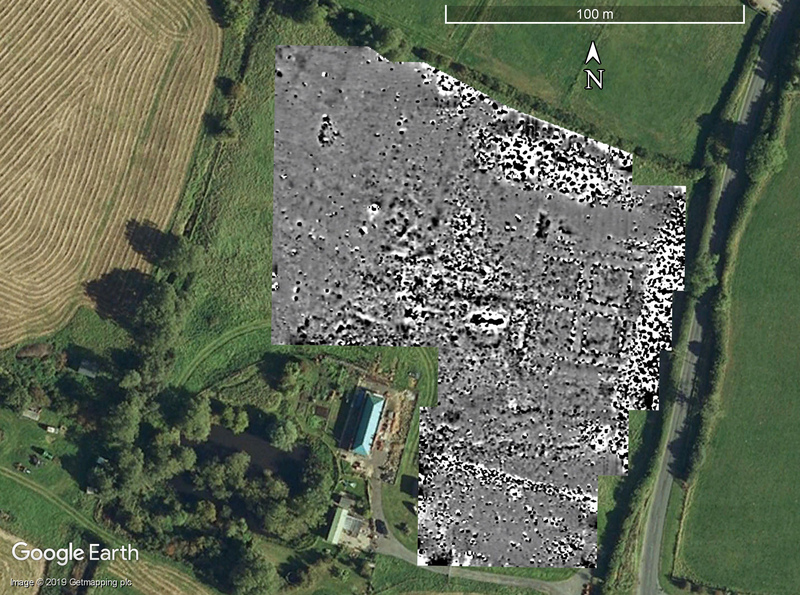 This entry was posted in Bovenay and tagged ahrc, Bovenay, Buckinghamshire, Buckinghamshire Archaeological Society, burials, CAGG, church, community archaeology, earth resistance survey, geophysical survey, Geoscan RM85, GPR, GPR Slice, Ground Penetrating Radar, multiplexed survey, SEAHA, ucl on April 2, 2019 by hertsgeosurvey. Gil Burleigh asked us if we could survey a field in Ashwell. The field is quite small at just 1ha. Some nice finds had come from this field including a nice scabbard chape (Fig. 1) in the 1970s. The field was ploughed for a short period in the 1980s, and North Herts Museums undertook a fieldwalking survey in 1986 which retrieved pottery from many periods with concentrations of Roman, Medieval and post-Medieval material and a thinner scatter of Iron Age and Anglo-Saxon pottery. 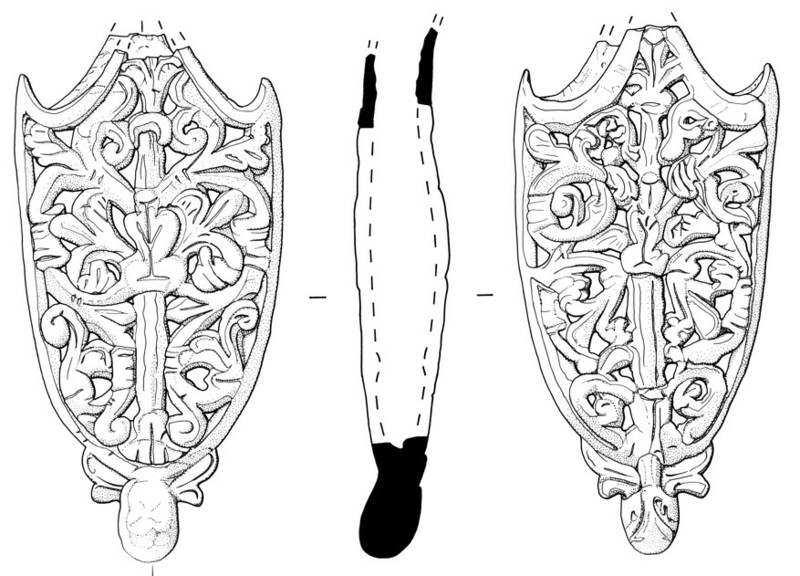 Figure 1: scabbard chape © North Herts Museums. 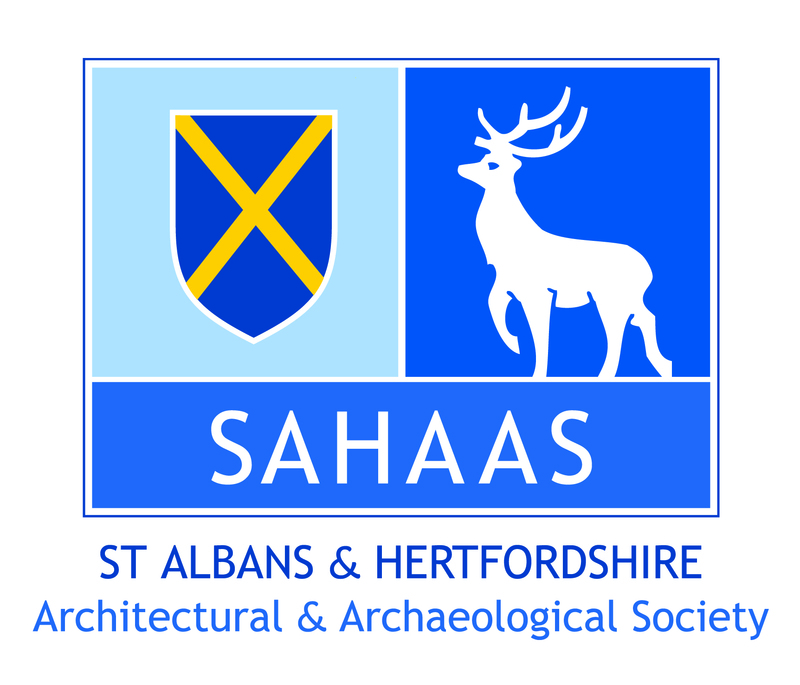 Members of North Herts Archaeological Society excavated three small test trenches over the weekend of the 16/17th March and found archaeological features in two of them. Soil test trenches has also revealed archaeological features in test pits SA01 and SA02 (although they were misinterpreted as just deeper topsoil! Figure 2). Figure 2: Location of the NHAS test pits (in red) and the soil test pits (SA01 to SA05). © CAGG. As the site is pasture over chalk, it seemed likely we would get a good result. Magnetometry was the obvious technique to try (Fig. 3). Figure 3: Nigel “compensates” the magnetometer. Photo © Mike Smith. We managed to complete the whole field in a day with the mag, which was excellent progress. I was exciting to see what we had detected and processed the data that evening (Fig. 4). Figure 4: the mag survey © CAGG. My initial reaction was “ugh”. Why was the data so horribly noisy, like some sort of giant waffle maker? Although we can see some features, especially on the western edge, we cannot see all that much going on, and nothing around where the trenches had revealed archaeological features. Can we explain this? 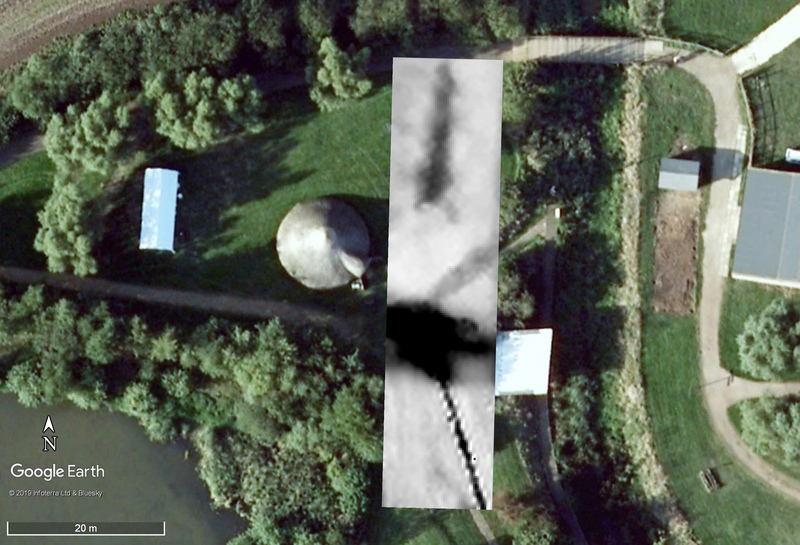 Peter Alley flew the site with his UAV. The photos from his flight can be used in two ways: they can be stitched together to produce an orthomosaic (basically an aerial photograph corrected for distortions) or to map the topography. The orthomosaic is fun, but doesn’t help us solve our problem (Fig. 5). 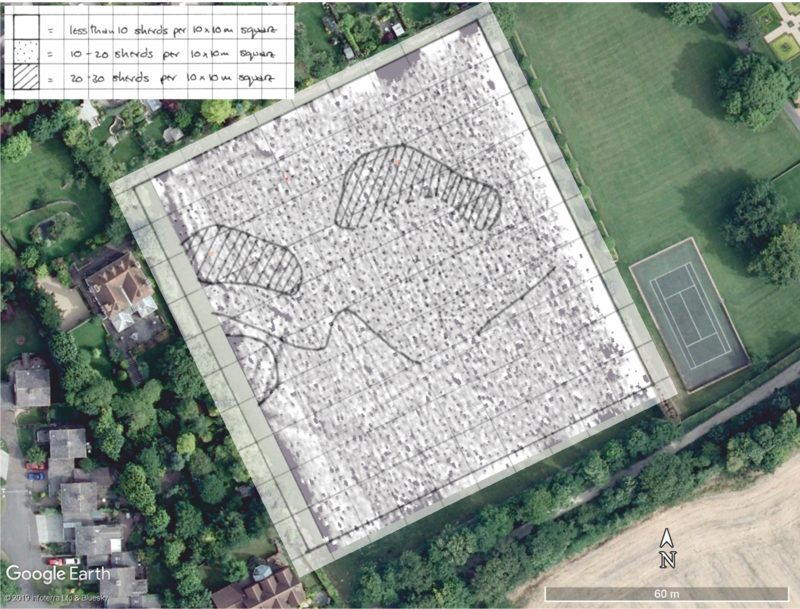 Figure 5: Orthomosaic from the aerial survey © Peter Alley. 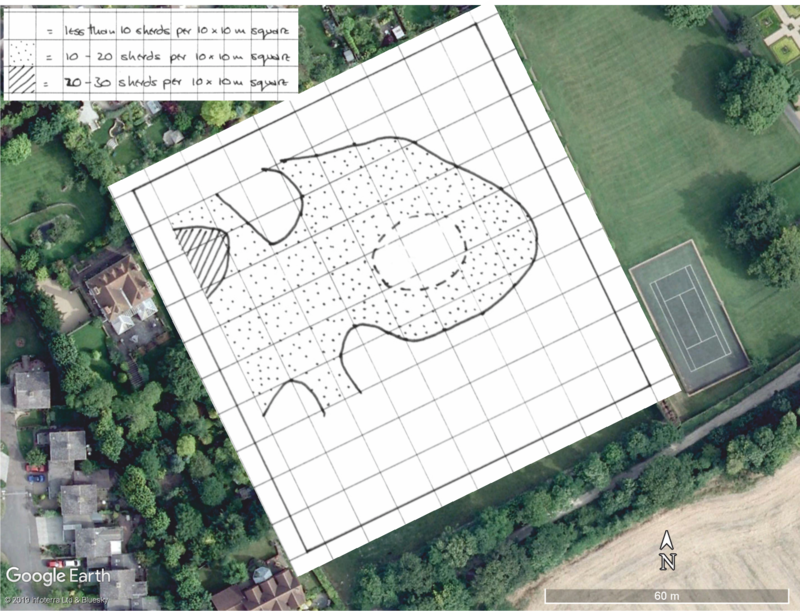 Mapping the topography shows the basic form of the site, basically a flat field on a slope (Fig. 6)! Figure 6: the topographic survey derived from the UAV images. © Peter Alley. If we use a hill-shade, however, we can see the micro-topography of the field. Lighting the field from the SW creates Figure 7. Figure 7: topography lit from the south west. © Peter Alley. 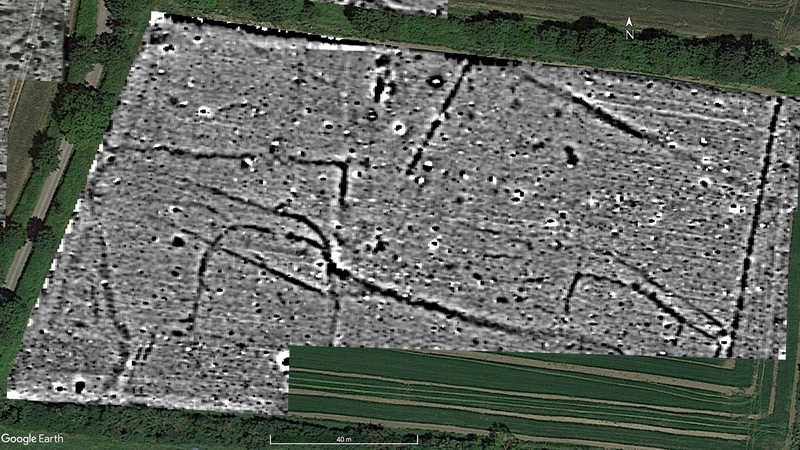 We can see from Figure 7 that even though the field has not been ploughed since the late 1980s, the plough scars remain running up and down the slope. If we move the light to shine from the NW we get Figure 8. Figure 8: topography lit from the NW. © Peter Alley. Now we can see plough scars running across the slope! This is, in part, the origin of the noisy data: the cross cutting ploughing has left a surprisingly uneven surface, like the proverbial giant waffle iron. We should assume this is mirrored by scars in the surface of the underlying chalk and archaeology. One further possible cause of the problem are thirty years worth of ant hills (Fig. 9). 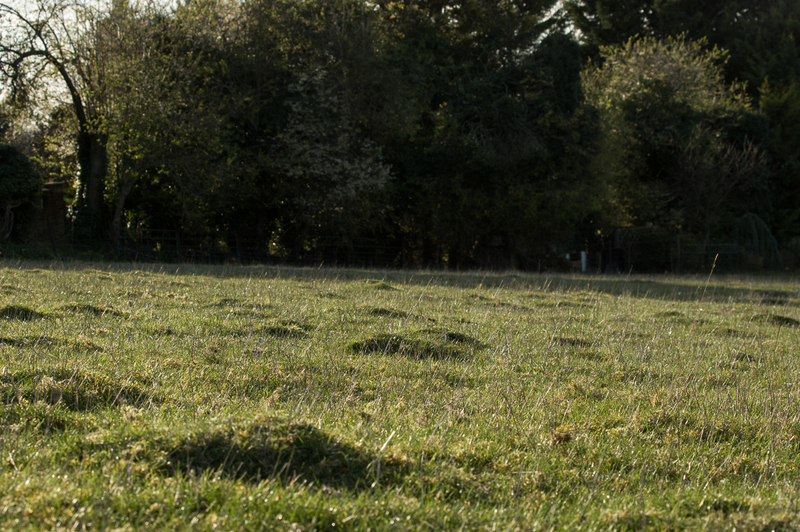 Figure 9: ant hills at Ashwell. © Kris Lockyear. 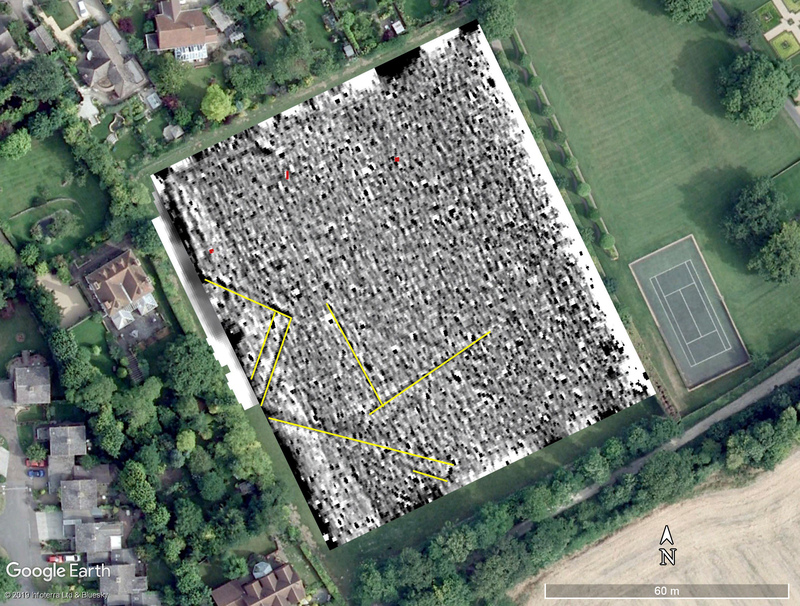 These aspects of the site, in part, explain the noisy looking data but do not completely explain the lack of contrast between the fills of the features and the chalk. Gil reported that the metal dectectorists were also having problems with large numbers of responses in this field, so the mystery isn’t completely solved. A plane did crash in this field during World War Two, but I cannot see how that has created this problem unless the whole field went up in flames. Ideally, we would take some samples and test the magnetic susceptibility of them. There are, however, some features in the data, despite the noise. I have outlined the ones I can see in Figure 10. 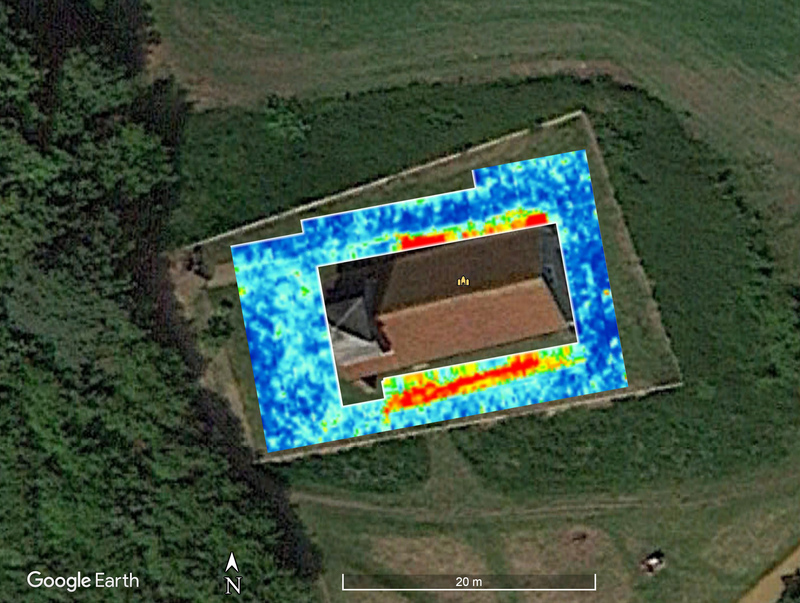 Figure 10: magnetometry survey results with interpretation shown in yellow (cf. Fig. 4). © CAGG. Two of the possible features run down and across the slope in a manner similar to the plough scars, and we must be cautious in their interpretation as a result. The corner that is protruding from the western field boundary is much more interesting. It looks like we may have clipped one side of an enclosure. (We seem to specialise in enclosures that don’t enclose things.) It looks like it probably runs under Ashwell House next door. In the middle is a “dark blob”. Initially, I thought this was likely to be metal as it is so close to the edge of the field where the fencing creates a strong response. Checking the values in TerraSurveyor, the range of values towards the east of the blob is from -2nT to +12nT. If one goes right to the edge where one can see the impact of the fence on either side, the values jump to about -4nT to +26nT. Contrary to my initial thought, this might well be an archaeological feature in the enclosure. 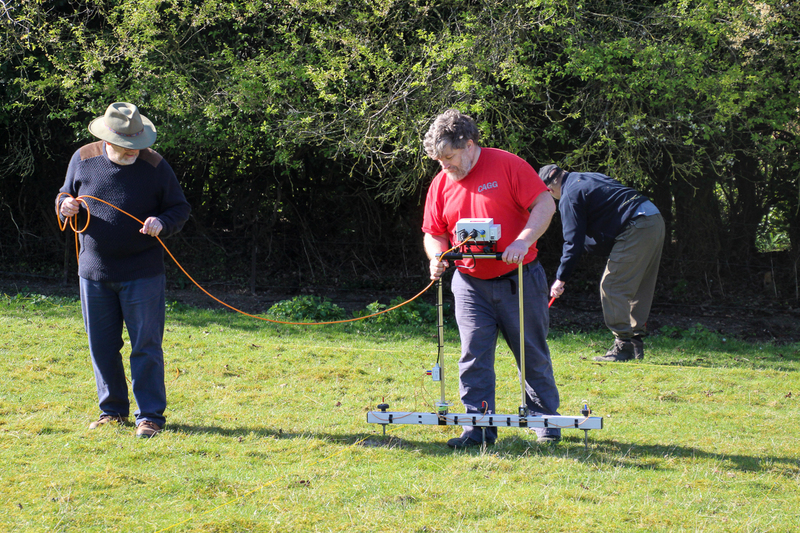 On the Saturday we completed a 40x40m block of Earth Resistance survey in the NE corner of the field. Not a great deal showed! We decided to persist on the Sunday so that we could include the area of the “enclosure”. We had some unusual help (Fig. 11). Figure 11: Unusual help with the Earth Resistance survey. © Kris Lockyear. As has become our standard method, we used the Earth Resistance meter on the 1+2 setting. In other words, every time we stick the mobile probes in the ground the machine takes three readings. One uses the two outer probes which are a meter apart to measure down to about a meter or so. The other two readings use the inner probe to take two side-by-side readings with a 0.5m probe separation, looking about 50–70cm into the ground (Fig. 12). Given the topsoil is only about 30cm deep, this should be fine. Figure 12: the Earth Resistance survey underway. Photo © Gil Burleigh. The results, were, underwhelming… (Figs 13 and 14). Figure 13: Earth Resistance survey with 0.5m mobile probe spacing. Figure 14: the Earth Resistance survey, 1.0m mobile probe spacing. I can only conclude that the difference in moisture retention between the features and the chalk was minimal. Peter Alley made the excellent suggestion that the banding we can see is possibly related to the layers within the chalk geology. We have one last source of data to examine. In 1986 Keith Fitzpatrick-Matthews undertook a field walking survey here for North Herts Museum Service. Obviously, he didn’t have the luxury of a GPS to log his finds or lay in his grid. We can, however, roughly position the results on the map with a bit of careful editing in a drawing package. Figures 15–17 show the three most common types of pottery: Romano-British, Medieval and post-Medieval. Figure 15: Romano-British pottery distribution © North Herts Museum Service. Figure 16: Medieval pottery distribution © North Herts Museum Service. Figure 17: Post-Medieval pottery distribution © North Herts Museum Service. The post-Med distribution doesn’t seem to fit our survey results. Both the Roman and Medieval ones, however, are temptingly close to the feature on the western side. By making the distributions transparent we can see how these match (Figs. 18 and 19). Figure 18: Romano-British pottery overlain on the mag data © North Herts Museum Service and CAGG. Figure 19: Medieval pottery overlain on the mag data © North Herts Museum Service and CAGG. Both the Romano-British and Medieval pottery distributions lie just to the north of the “enclosure”, down slope from it. This is what one would expect if the material collected on the surfaces derives from the fills of the features. We can only be sure of the date of this feature by further excavation. 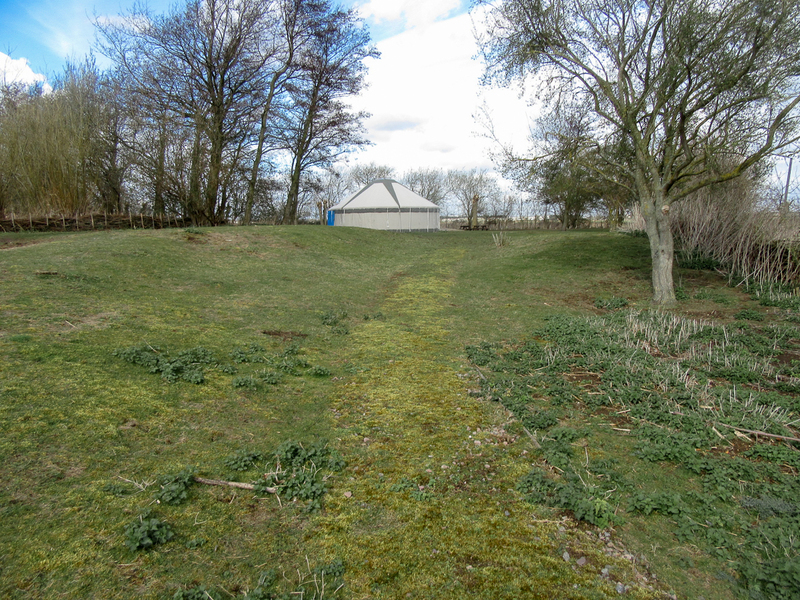 Although this survey has not produced the beautifully clear results we have had from other sites such as Kelshall, it has shown some interesting features. 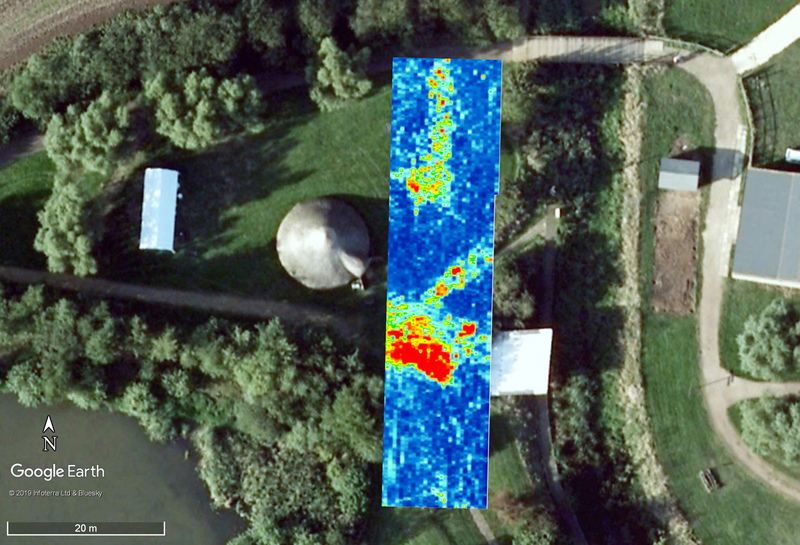 It is also a good example of the value of combining different data sets, in this case field walking, aerial photogrammetry and magnetometry. Many thanks to everyone who helped with the survey and fetched and carried equipment. Also, thanks for Gil for suggesting we have a look at this site and David Short for allowing us access to the site. 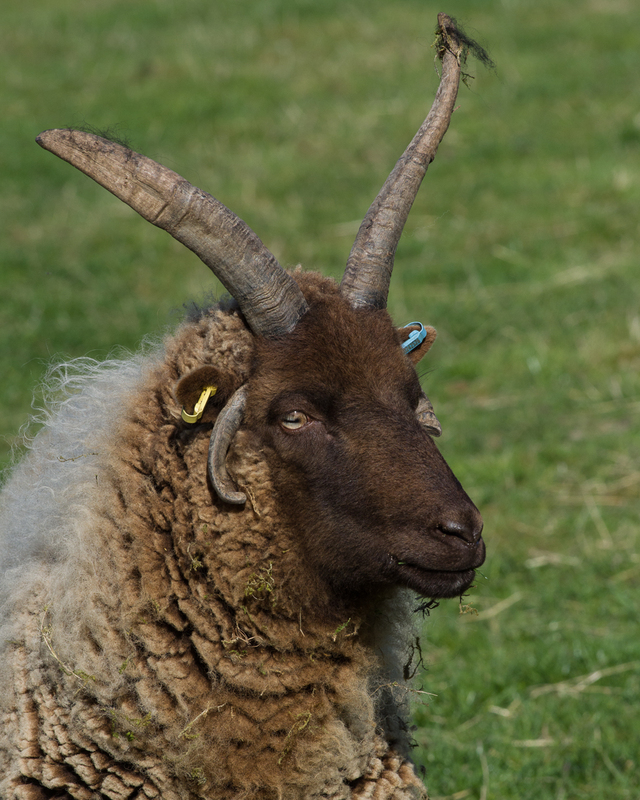 As 19 images seems an odd number to finish on, I thought I would sign off with another photograph of one of David’s magnificent sheep (Figure 20)! 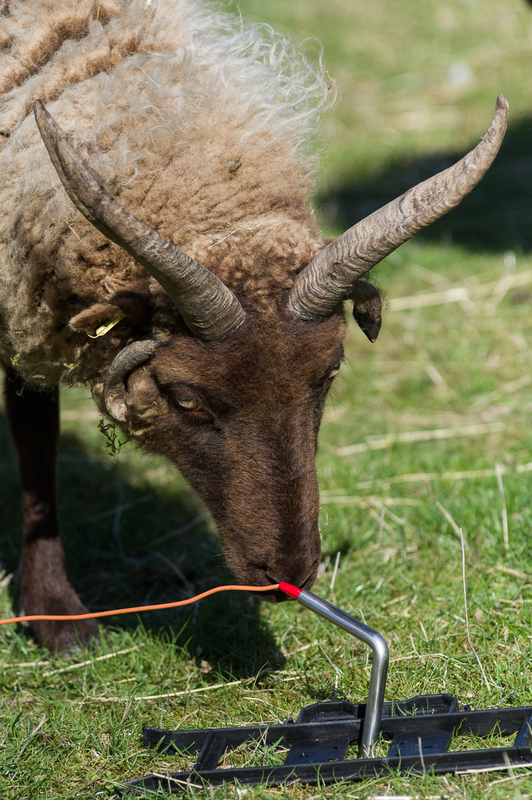 Figure 20: A sheep. Photo © Kris Lockyear. 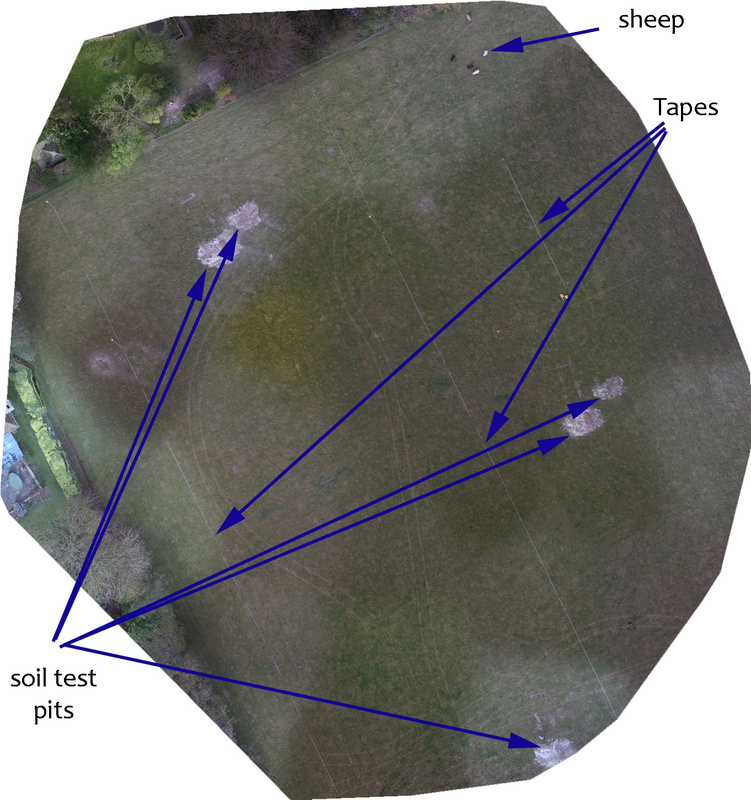 This entry was posted in Ashwell and tagged ahrc, Ashwell, CAGG, earth resistance survey, geophysical survey, geophysics, Hertfordshire, magnetometry survey, NHAS, photogrammetry, sheep, UAV, ucl, WAS on March 27, 2019 by hertsgeosurvey. Before I start this post, I should apologise to those waiting for other surveys… There has been some fiddly data processing (including software training over Skype from Hawaii! ), as well as problems with coordinate transforms and other boring technical stuff. I promise I’m working on them! 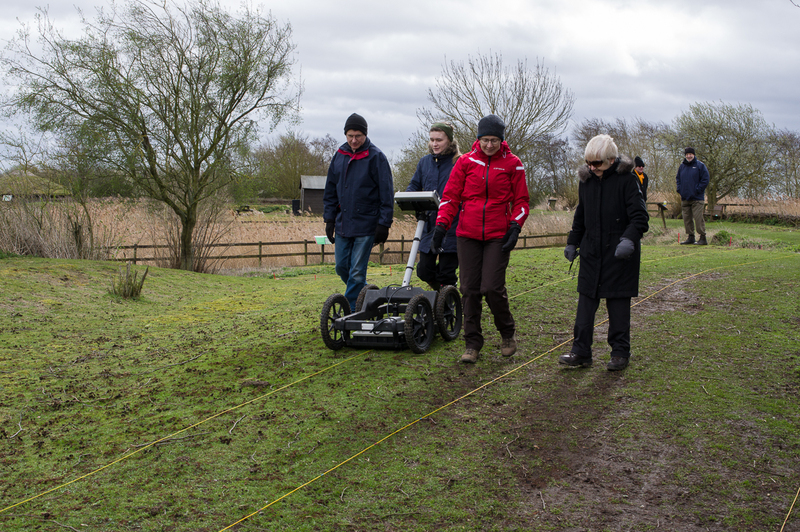 The group were asked to provide a day’s training on geophysical survey at Flag Fen for the volunteers from Vivacity who help run the site and others in the Peterborough area. Many thanks to Peter Alley for setting this up. We planned to survey two areas: a small strip in the public area of the site across the known line of the Roman road, and a second larger area to the west through which is known to pass the Bronze Age wooden causeway. We managed to survey the small strip using all three techniques: mag, Earth resistance and GPR, but the howling gale resulted in only the mag being able to survey a little in the second area. 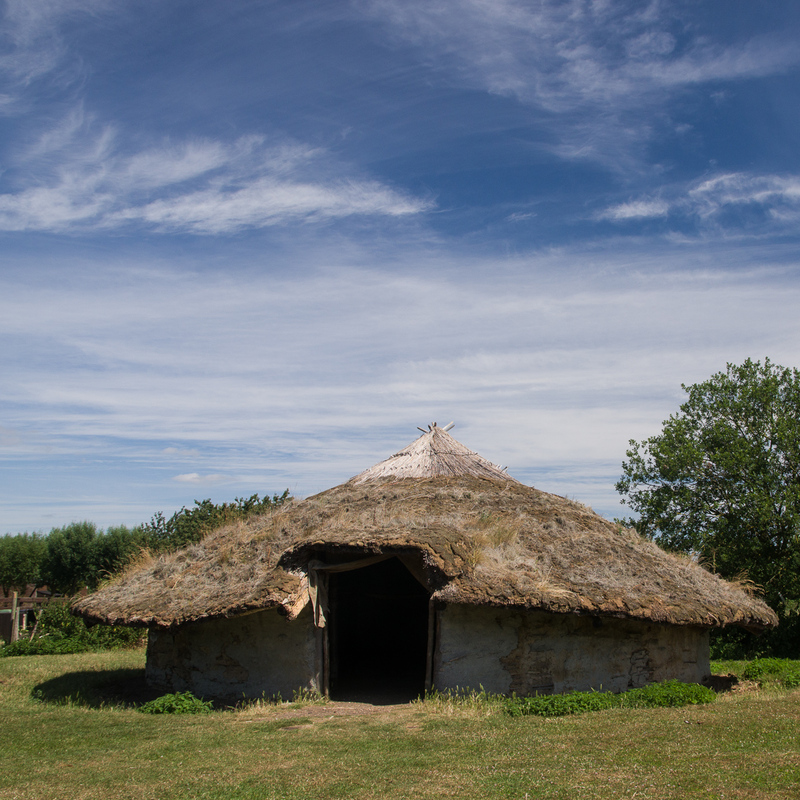 Figure 1: Reconstructed round house at Flag Fen. 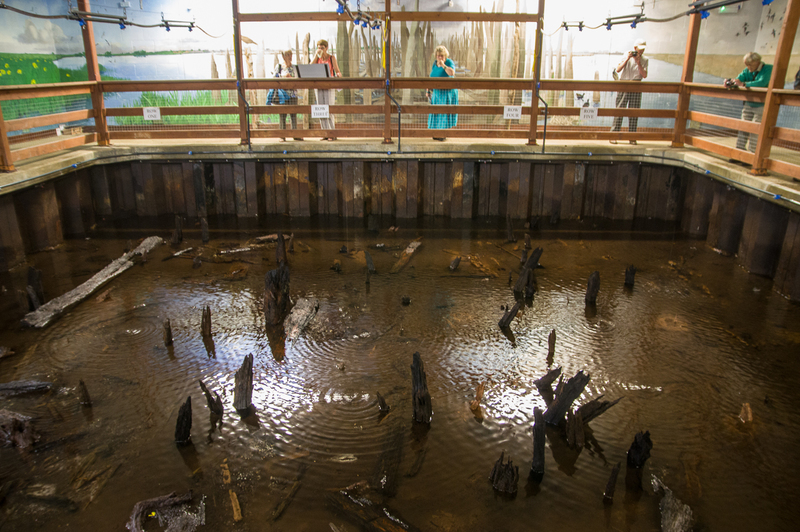 Figure 2: preserved timbers in situ at Flag Fen. Area A was a small strip just 14m wide and 57m long. It does, however, cut across the known line of the Roman road. We managed to complete all three techniques in this area. For the Earth Resistance survey we were using the “1 plus 2” method. When we do this, the machine takes three readings when we stick the mobile probes into the ground (Fig. 4). The first reading uses the outer two probes which are 1m apart. This means we are looking roughly 1m below the ground surface. It then takes two further readings, the second using the left-hand probe and the centre probe, and the third using the centre probe and the right-hand one. These pairs are 0.5m apart and we are therefore looking about 0.5m below the ground surface. The deeper survey is at a lower resolution of two readings per meter square than the shallower survey which is at four readings per meter square. Figure 4: the Earth Resistance meter in action. The results were very encouraging. Figure 5 shows the 0.5m mobile probe spacing survey. Figure 5: the Earth Resistance survey (0.5m probe spacing). In Figure 5 high resistance readings are dark, and low resistance readings are light. High represents solid things like paths and roads. 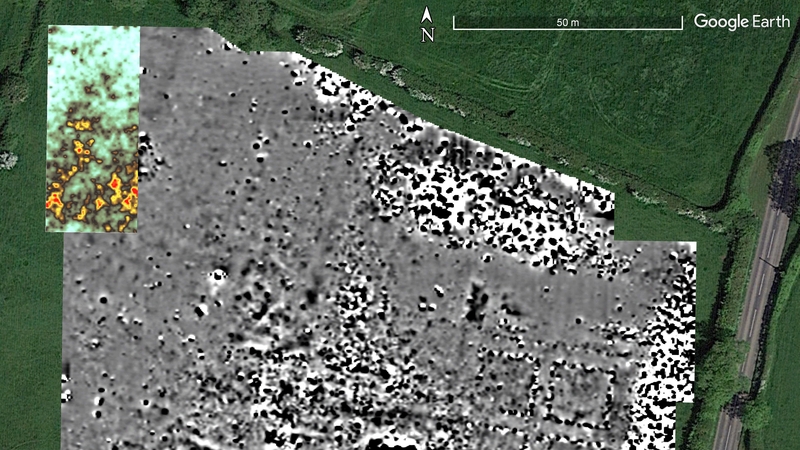 In this image we can see one large high resistance feature in the middle, a thin linear one to the south, and a wider north-south high resistance feature in the northern third of the survey area. I have labelled these in Figure 6. Figure 6: labelled version of Figure 5. The big high resistance feature matches the known location of the Roman road. The thin linear feature matches the current path (Figure 7). Figure 7: the path at Flag Fen shown clearly by the moss. Photo ©Peter Alley. This leaves us with Mystery Features A and B, and the hole in the road. The latter could be (a) robbing of the road for building materials (b) an old archaeological excavation or (c) levelling of a spot for the toll house. My money is on (a) or (b)! 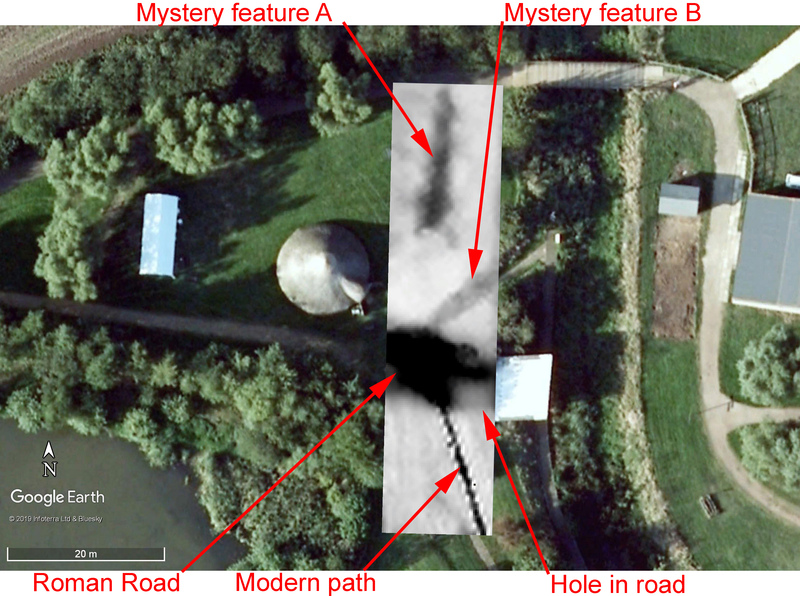 Mystery feature B can be solved by looking at the historical imagery available on Google Earth. 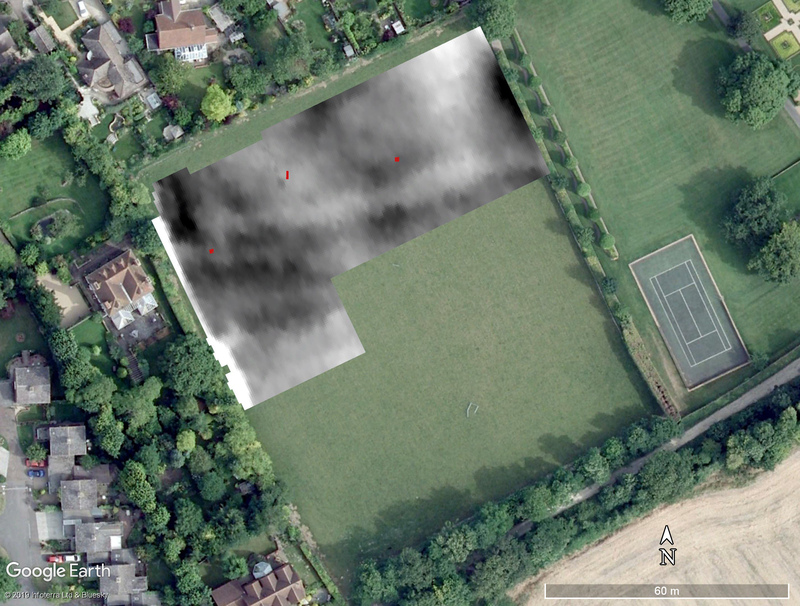 I have put the geophysics images over the photos from 11th September 2006, which I have reproduced below (Figure 8). Figure 8: imagery from September 2006. One nice thing about this image is that it shows an excavation in progress. It also solves Mystery feature B: there is clearly a path or walkway running across the site at that spot (remember that the Google Earth images are not very accurately georeferenced). There is also a curious bright square in the photo which I am guessing is a roof to protect where the section of the Roman Road could be seen in the edge of the dyke. Mystery feature A, however, remains just that, mystery. Maybe it is one wall of the toll building, but it is very wide and so would just be a spread of rubble. There is clearly a high resistance feature here, but exactly what it is I do not know. Figure 9 shows the deeper Earth Resistance survey. Figure 9: the Earth Resistance survey (1m mobile probe spacing). This survey does not show much new but three things should be noted. Firstly, the hole in the Roman road has gone and is, therefore, not right through all the layers of the road. Secondly, mystery feature A is even clearer suggesting that this feature is more substantial at depth and is unlikely to be merely ground compaction. Lastly, the modern path has vanished. This is because the wider probe spacing means that we are now looking below the level of the superficial path. 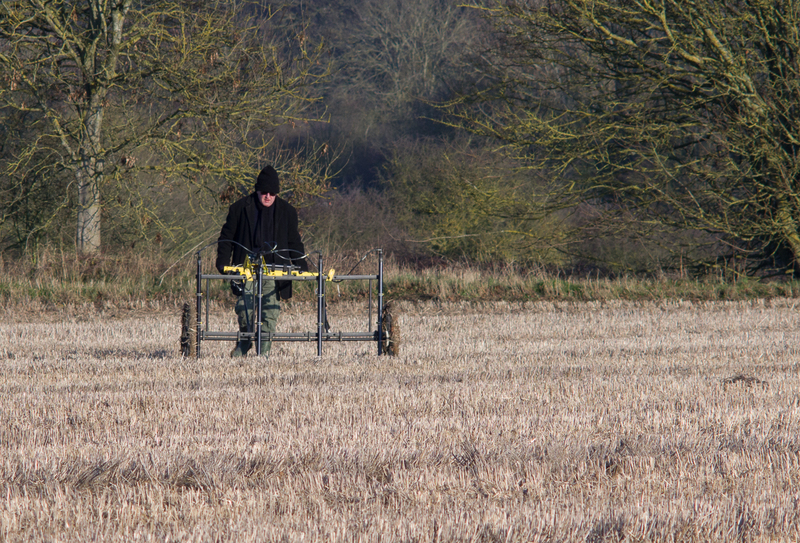 Figure 10: the GPR survey in action. With GPR we collect data in vertical “radargrams” which are difficult to read until one has had some practice (I’m still learning!). One then takes those vertical slices and stacks them together in the software, and then slice them horizontally to give map-like images at different depths called time-slices (or amplitude maps if one wants to be posh). In Figure 11 I have plotted the top 8 slices with the shallowest slice in the top-left corner and the deepest in the bottom right. In these slices blue represents weak reflections, i.e., little or no radar waves are bouncing back to the antenna. Red represents strong reflections, i.e., a great deal of the signal is bouncing back. 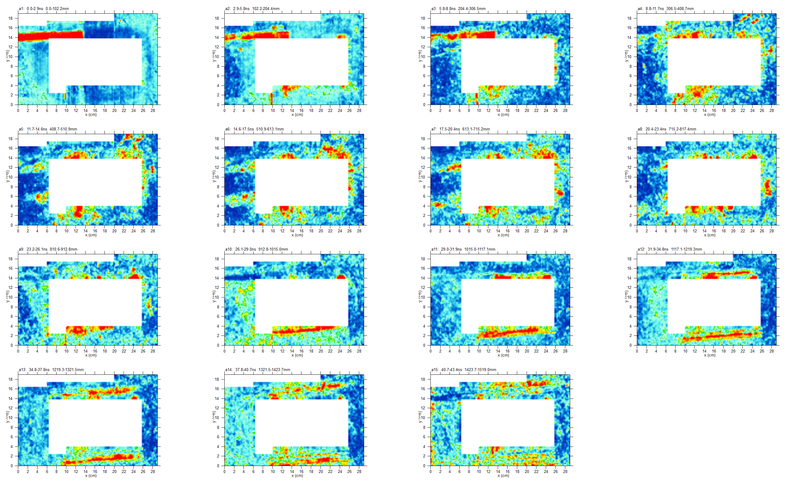 Figure 11: time slices from the GPR survey. In the first slice, the modern path shows very clearly right on the surface. Note that the tracks from their little cart also show along the western edge. This is simply from soil compaction. By the third slice, the Roman Road, and mystery features A and B are starting to show nicely. By slice 6, pretty all that one can see is the Roman Road. Note that one should take the depths with a pinch of salt. Firstly, I should have built-in to the processing the topography, which I haven’t. Secondly, the speed of the signal has not been calculated so this is just a rough guess. Figure 12 shows the fifth slice in place so that you can see how it matches up to the res and the site. Figure 12: GPR slice 5. As I mentioned before, understanding the radargrams (the original vertical slices) can be difficult. This is because what we are dealing with are reflections. High amplitude reflections can show down the profile like echoes in a empty room. Also, a single point, like a stone, will show as a hyperbola (a curve with the middle at the top). This is because when you are off to one side, some of the radar signal will bounce off that point but the distance is the diagonal. As you move closer, than diagonal gets shorter until you are over the top and the reflection is directly below you. As you move past, the distance increases once more. The software I use allows one to create 3D images with both the time slices and the radargrams combined which I find helpful in understanding the latter. Figures 13 to 15 show three examples. 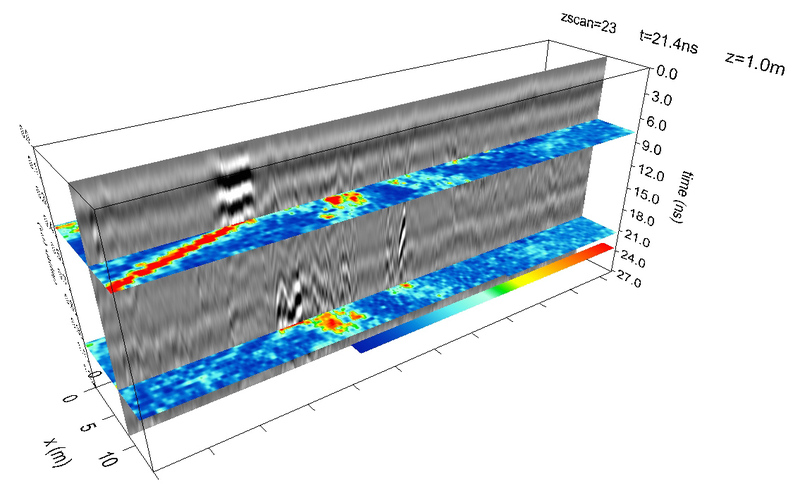 Figure 13: 3D representation of the GPR data. 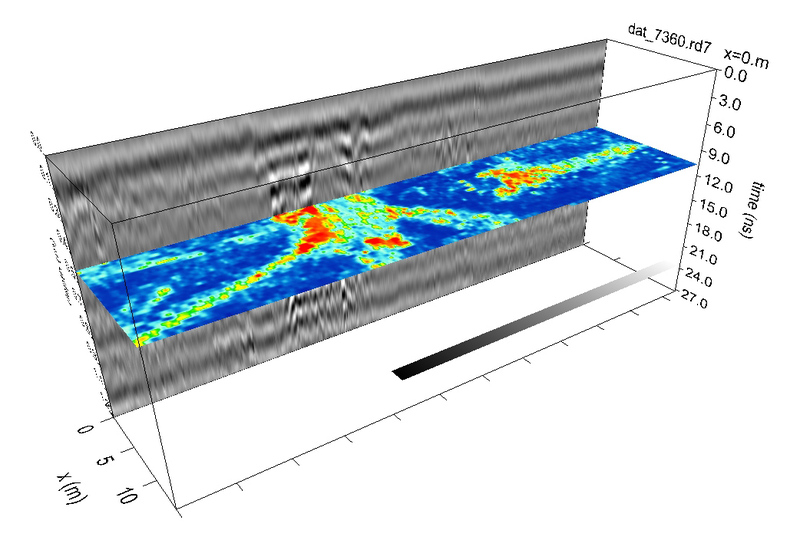 Figure 14: 3D representation of the GPR data. 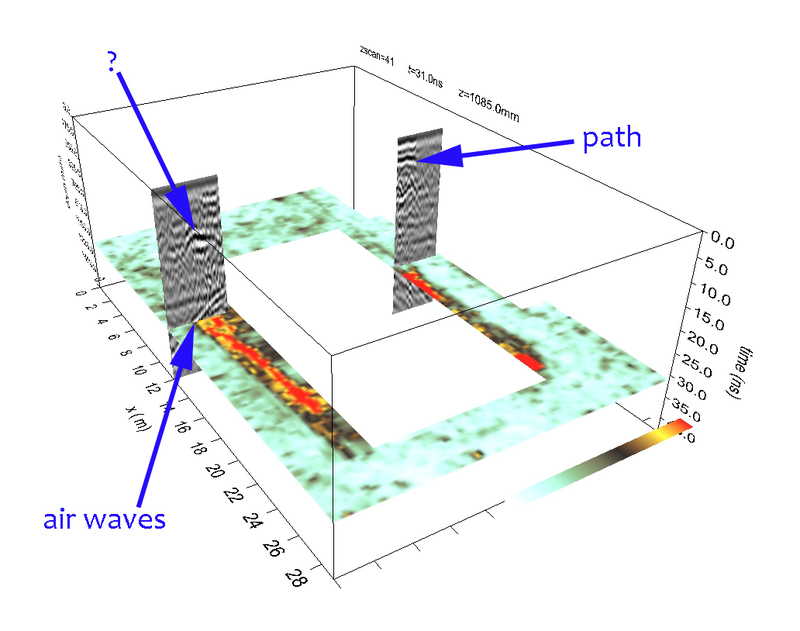 Figure 15: 3D representation of the GPR data. 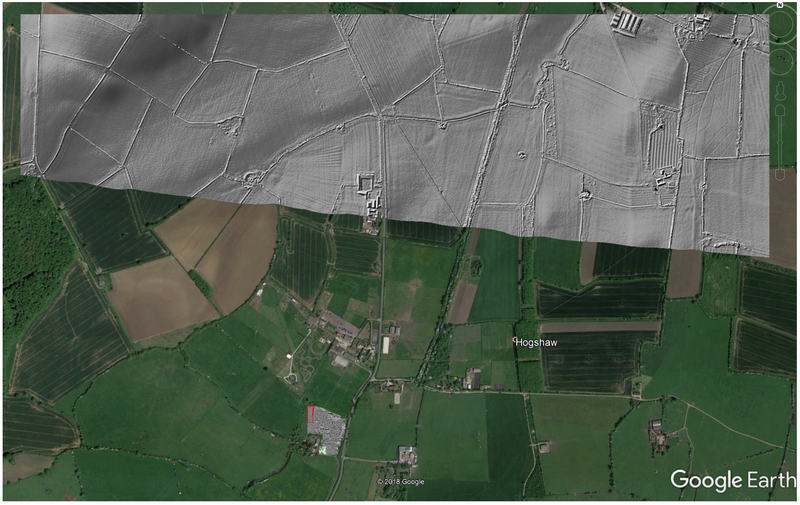 In Figure 13 I have picked a time-slice which shows the Roman Road well. Notice the strong reflections in the radargram (showing as dark black and bright white) matching up with the red in the time slice showing the strong reflections. 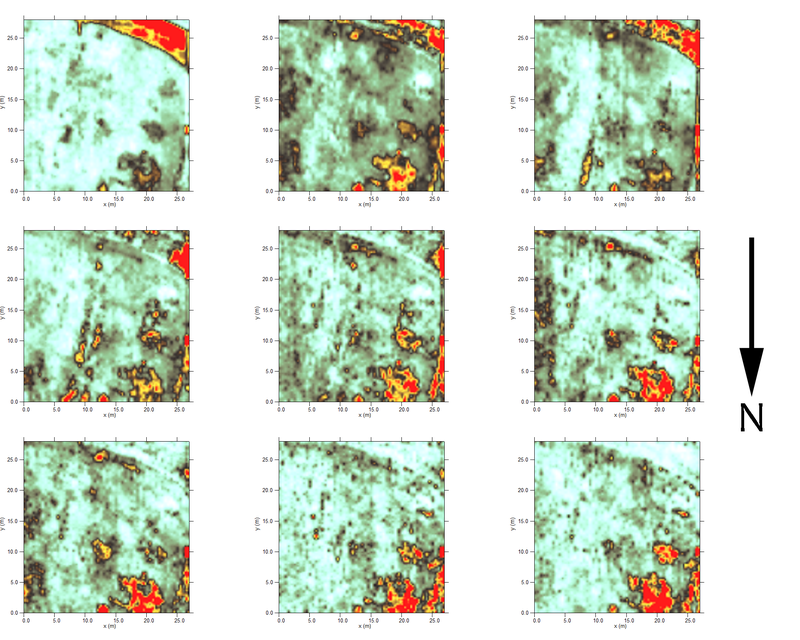 In Figure 14 I have used a radargram that cuts across mystery feature A. Notice the very jagged and noise area of the radargram over the line of the mystery feature. We are not getting very strong reflections like the road, but we have also gone along the feature rather than across it. When surveying something linear, it pays to try and cut across it rather than go along it. Our transects are 50cm apart, but we take a set of readings every three centimeters. That is why we always survey Christian cemeteries north-south not east west. In Figure 15 I have two time slices. the top one shows the modern path clearly. Note how the strong reflections start from the very top. The bottom slice show the reflections from the Roman Road, just clipping the edge of the hole. 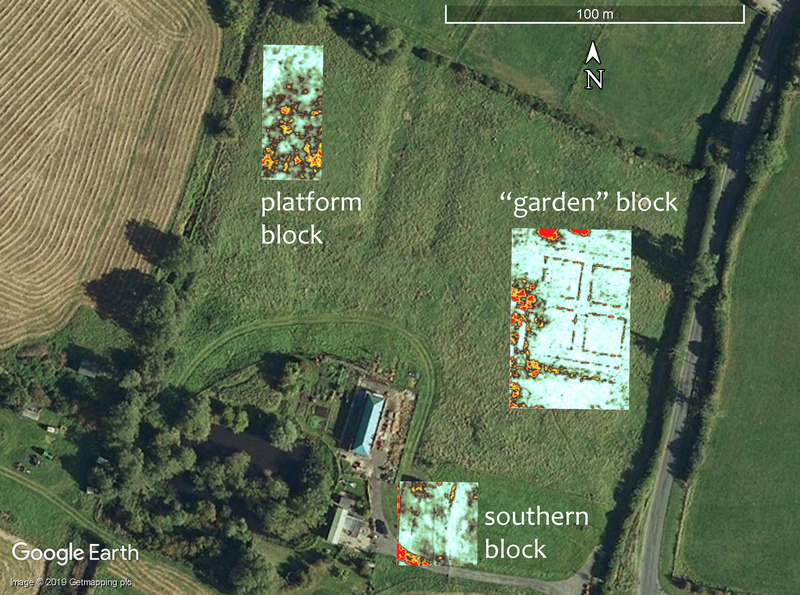 Hopefully, these images will help to explain how to work with GPR data! Last, but not least, the magnetometry survey. 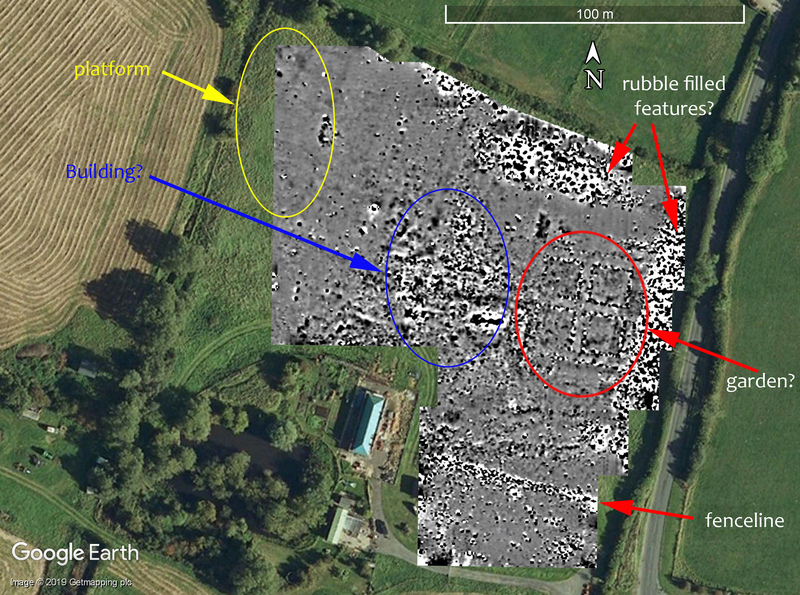 Magnetometry is the mainstay of geophysical survey because (a) it is quick and (b) is often finds stuff! It’s main weakness is in areas with lots of ferrous material around, like a public spot with paths, fences, old excavations and a yurt… As a technique, it likes the wide open spaces (Figure 16)! Figure 16: Mag survey at Flag Fen (Area 2). Figure 17 shows the results from Area A. 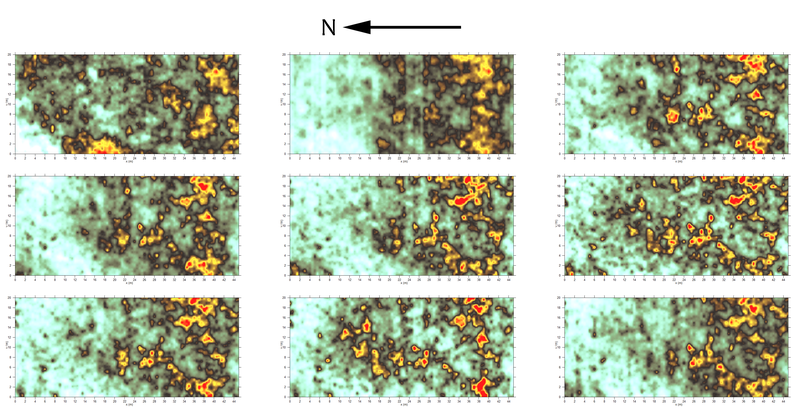 Figure 17: Area A magnetometry survey. The modern path shows very clearly with a strong magnetic response. Remember that magnets have a negative and a positive pole, and these are plotted as white and black in the image. Mid-grey is the background reading. The path probably used a magnetic rock, like granite or basalt, in the gravel. Mystery feature B also shows very strongly. I’m not sure what they used for that path. Along the western edge to the south we have picked-up the modern fence line. Mystery feature A does not show in the data. There are various other bits of old iron about. In the northern half of the site are some features which are less strong than the others, and have a very weak negative pole (whitish) and the stronger positive pole. Some of these may be pits full of organics or burnt materials. Figure 18: the Area 2 mag survey. The first thing to note is the stripyness running diagonally across the grids. This is the remnants of ploughing showing in the data. This is very common in mag surveys. I have labelled some of the other features in Figure 19. Figure 19: the Area 2 mag surveyed labelled. The black blobs like the one labelled A are not that likely to be exciting. They are probably spreads of organics on the surface, or possibly burnt areas from getting rid of the stubble. There is a moderate amount of old iron in the field, as is always the case in agricultural fields. I have labelled just one as B. There are a few features which might be something more interesting. For example, at C, is a strong magnetic feature where the negative pole is very weak compared to the positive. That might be a pit with organics or burnt material in it. Perhaps the most exciting thing is the hardest one to see. At D there is a faint curving line. Almost a complete semicircle can be seen in the data which is about 7.5m in diameter. Have we found a round house? It is definitely a possibility! Hopefully, everyone who attended the training day enjoyed it and got something from it. 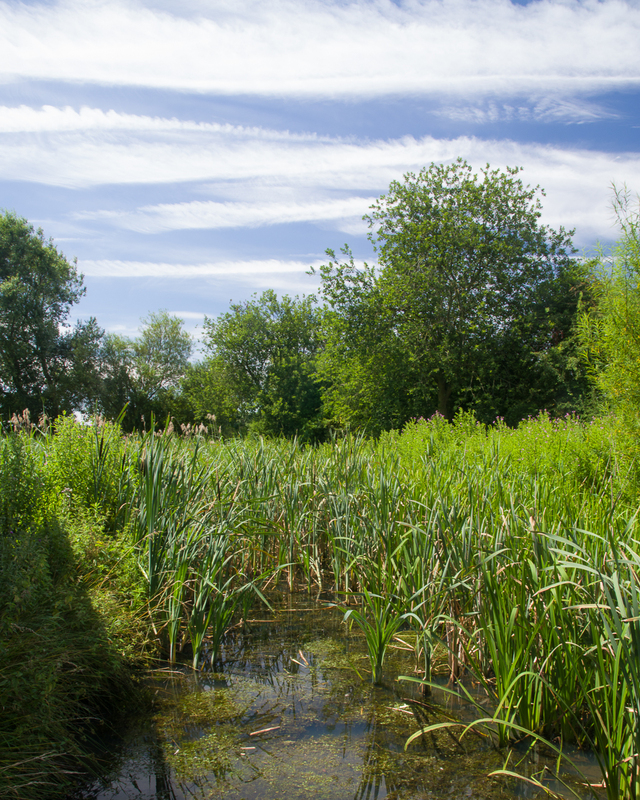 Many thanks to Peter Alley, Jim West, Mike Smith, Pauline Hey and Nigel Harper-Scott for helping with the day, and to Gill Benedikz and the rest of the staff at Flag Fen for making this possible. 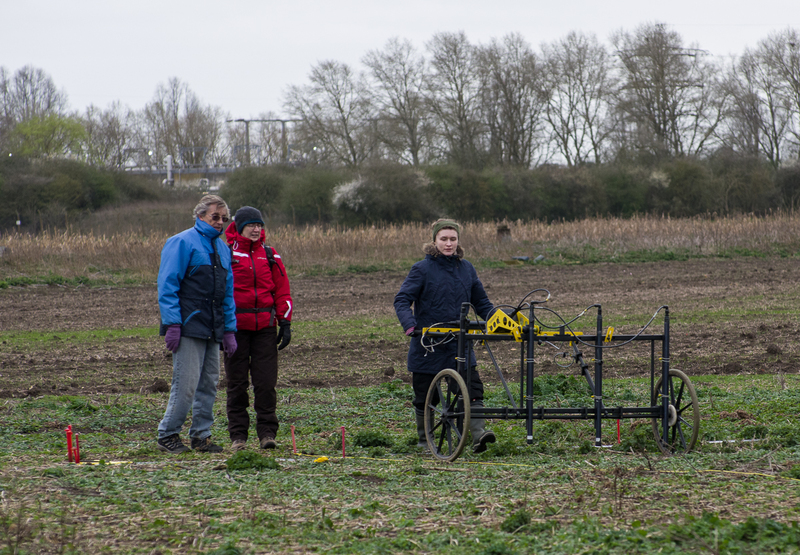 This entry was posted in Flag Fen and tagged ahrc, CAGG, community archaeology, earth resistance survey, Flag Fen, GPR, GPR Slice, magnetometry survey, TerraSurveyor, ucl, Vivacity on March 22, 2019 by hertsgeosurvey. Firstly, apologies to those waiting for the results of the GPR survey in the churchyard at Ashwell undertaken just before Christmas. I need to do some more data processing to see if we have some graves or not. Meanwhile, the site at Little Hadham has been one to which we have returned on-and-off almost since the beginning of the project. (Use the drop-down box on the right of this page to see previous posts on this site.) 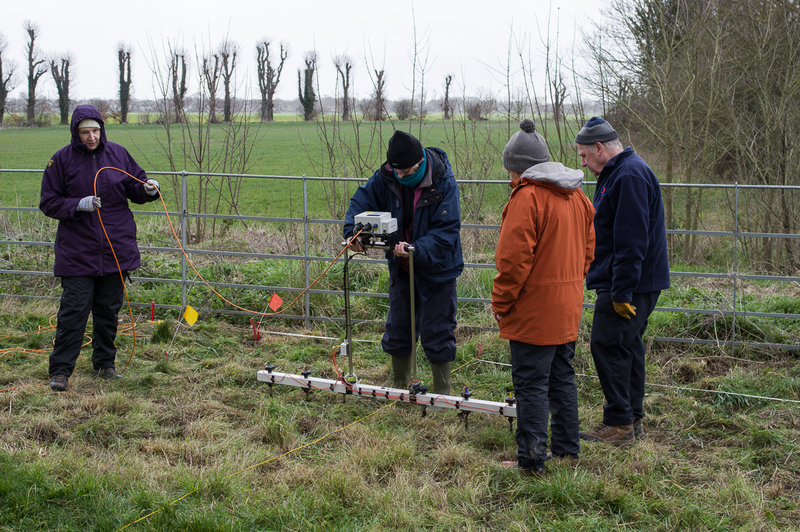 The site clearly extended beyond the area we had surveyed so far, and so CAGG once more teamed-up with members of the Braughing Archaeological Group (itself part of the East Herts Archaeological Society). We could only access one of the fields, the one we first surveyed in April 2014. Our aim was to extend the survey to the edges of the field, and to examine one group of features we had detected with the mag previously with an earth resistance survey. The morning was cold and crisp with a hard frost. The thermometer in Jim’s car registered minus 3 Celsius. Brrrrrr… Unfortunately, the frost melted quite quickly and muddy wheels on the mag became a problem (Fig. 1)! Figure 1: Nigel wheels the mag across the field. The mag team completed six grids, five of which were partials. Given the amount of time spent trowelling the mud off the wheels, this was a good haul. We have four partial grids left to complete the field. The results are given in Figure 2. Figure 2: the mag survey. The areas completed yesterday were the block to the far east of the survey area, and the incomplete strip of partials on the southern edge. 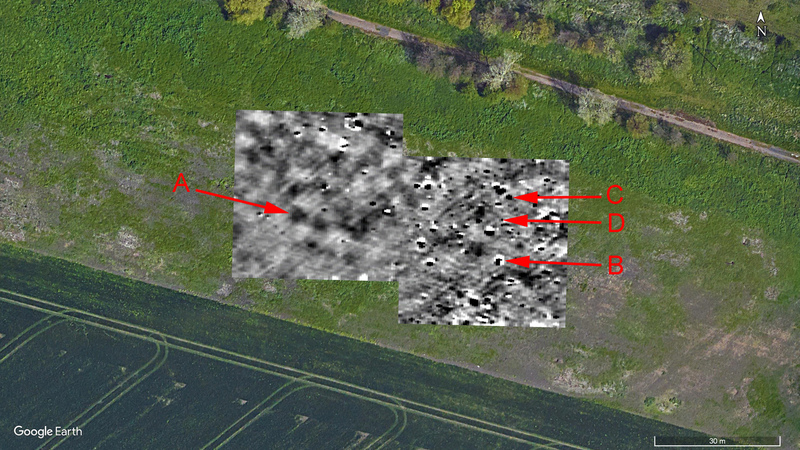 In the new area we can see the ditch previously detected (shown by the red arrow) carrying on across the site. It is fainter in Millfield to the west of the road, but is still evident. Near the hedge is another clear line of a ditch (marked with the yellow arrow). This one is worryingly straight and almost parallel to the field boundary. It maybe more modern than some of the other features. The curvy, more irregular ditches (shown with the blue arrow) may be something like a farmstead with boundary ditches. Picking apart the phasing of all these features is going to be difficult and would require some targeted excavation. 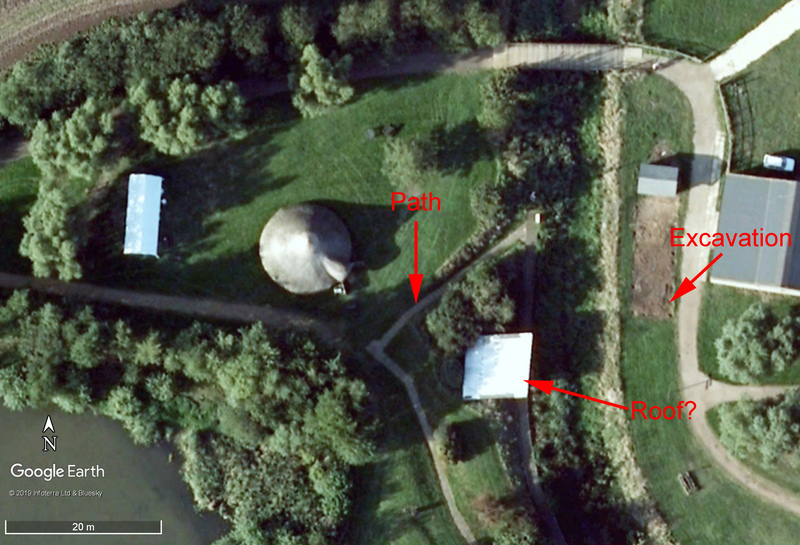 As we had a good sized team we also undertook some Earth Resistance survey (Figure 3). 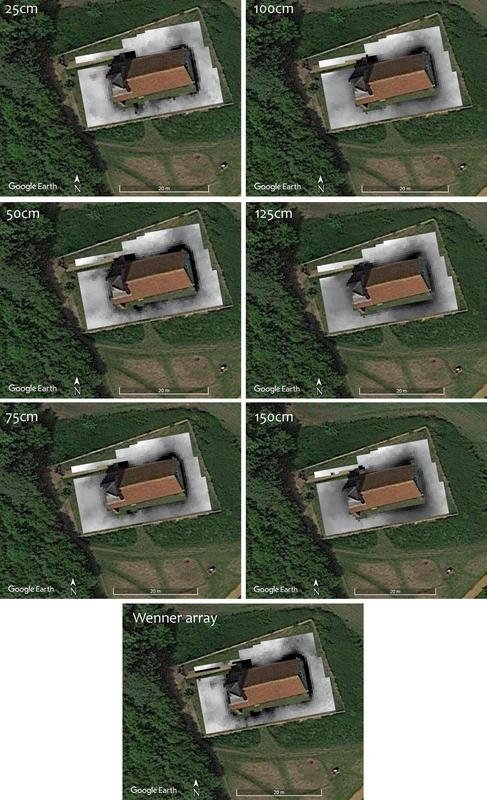 We targeted one of the possible farmstead enclosures. Figure 3: Katie Burgess and Peter Baigent (BAG) using the RM85 Earth Resistance meter. The team completed five 20x20m grids at a 0.5m reading spacing. The results are shown in Fig. 4, and the underlying mag in Fig. 5. Figure 4: the Earth Resistance survey results. Figure 5: the mag results in the area of the Earth Resistance survey. I had been hoping — rather optimistically — that the resistance survey might pick-up some structures. Sadly, it did not. There are, however, correspondences between the mag and res results. 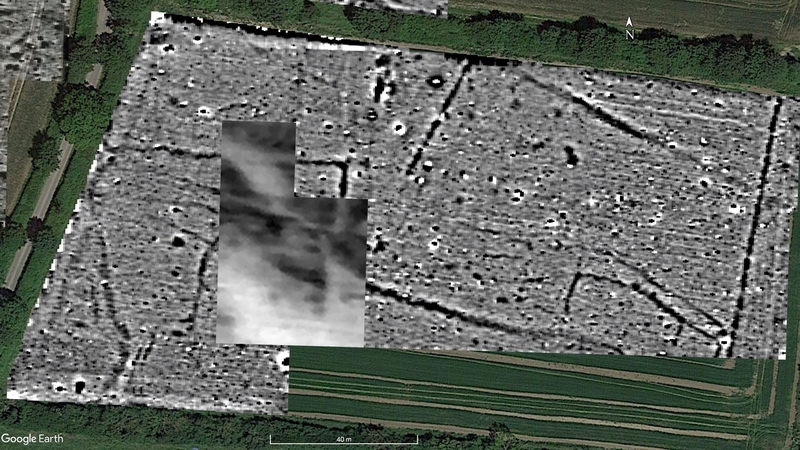 The ditch with the right-angle corner in the mag survey shows well, if slightly more diffuse, in the resistance data. Similarly, the long curving ditch also shows well. I have indicated one end of it with a blue arrow in Figure 6. Figure 6: Resistance survey results with arrows. More curious, however, is the change from low to high resistance along a straight line indicated with a red arrow in Figure 6. This corresponds exactly with the diagonal line in the mag data which cuts east-nor-east west-sou-west across the D-shaped enclosure. I’m at a loss to know what this represents. It maybe a reflection of the various cut features in the underlying geology. 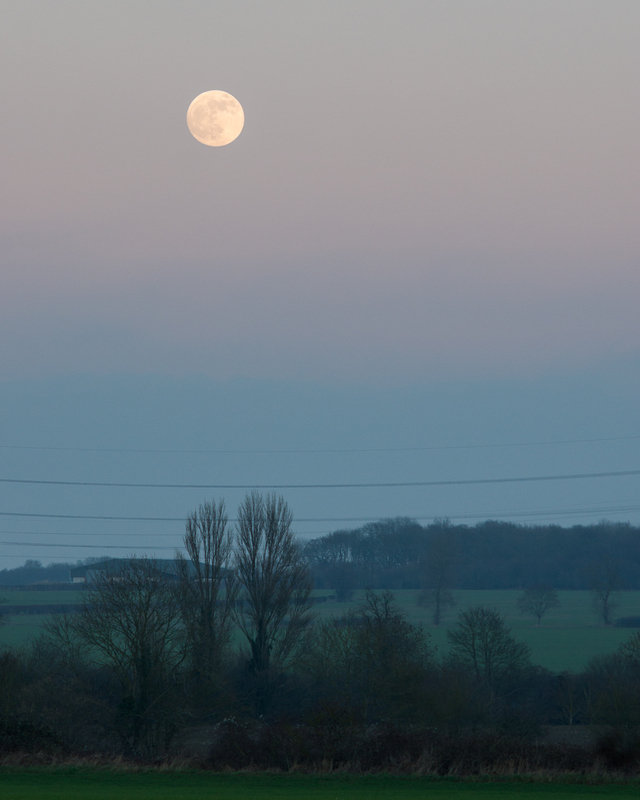 At the end of the day we were treated to a beautiful moonrise and sunset. Not quite the blood wolf moon seen some 12 hours later (when I was tucked-up and asleep in bed!). Figure 7: Moonrise. Shame about the electric cables! Many thanks to everyone who turned-out on a freezing but beautiful day. This site continues to repay our attention, and it worth the effort. We should try and survey some of it in the summer, however! 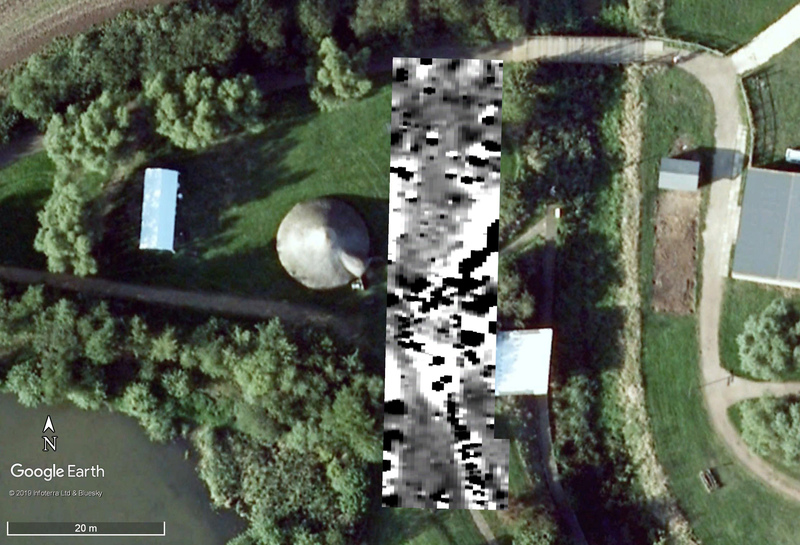 This entry was posted in Little Hadham and tagged ahrc, CAGG, community archaeology, earth resistance survey, Foerster, geophysical survey, geophysics, Geoscan RM85, Hertfordshire, Iron Age, magnetometry survey, Roman, ucl, WAS on January 21, 2019 by hertsgeosurvey. Firstly, CAGG was shorted listed for the CBA Marsh Award for Best Community Archaeology Project. 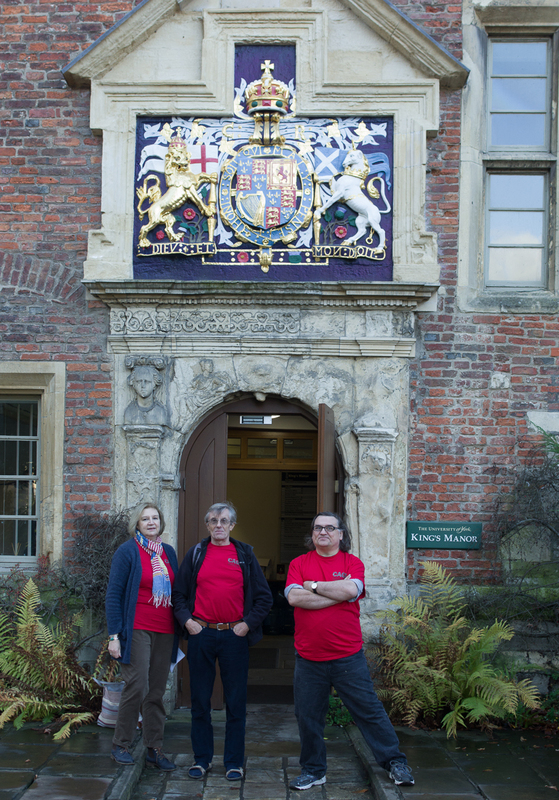 The CBA Archaeology day / AGM was held yesterday in York. Kris, Ruth, Peter and Jim went up for the event. Although we didn’t win (and congratulations to the group from Woking who did), it was a pleasing result to be listed in the top three projects. Congratulations to all our volunteers who have worked at Verulamium over the years. Secondly, this Tuesday sees the biennial “Near Surface Geophysics Group” conference at the Geological Society in Burlington House, Piccadilly. 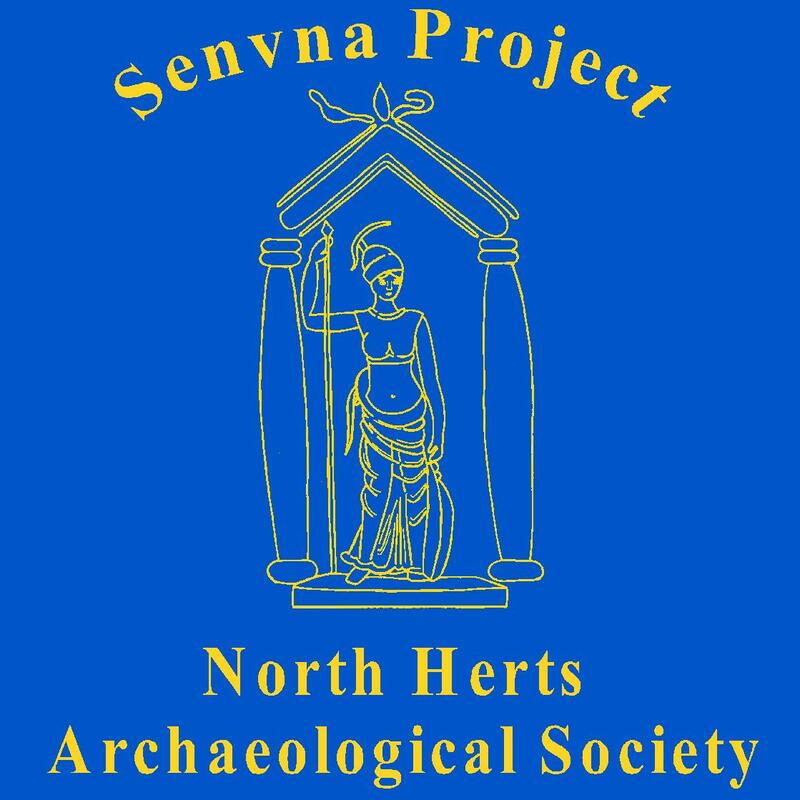 Those of you with good memories will recall that I gave a paper about the work at Verulamium at the last conference in 2016 (sadly, the link to storify.com no longer works as that service has been discontinued). This time round I decided to make a poster instead. As the poster is A0 (i.e., huge! ), I won’t post a link to the 145mgb PDF file but I have posted a much reduced file below. Please note, however, that even this is 10mgb so you’ll probably not want to click on it on your smart phone (for those of you who have such a thing). 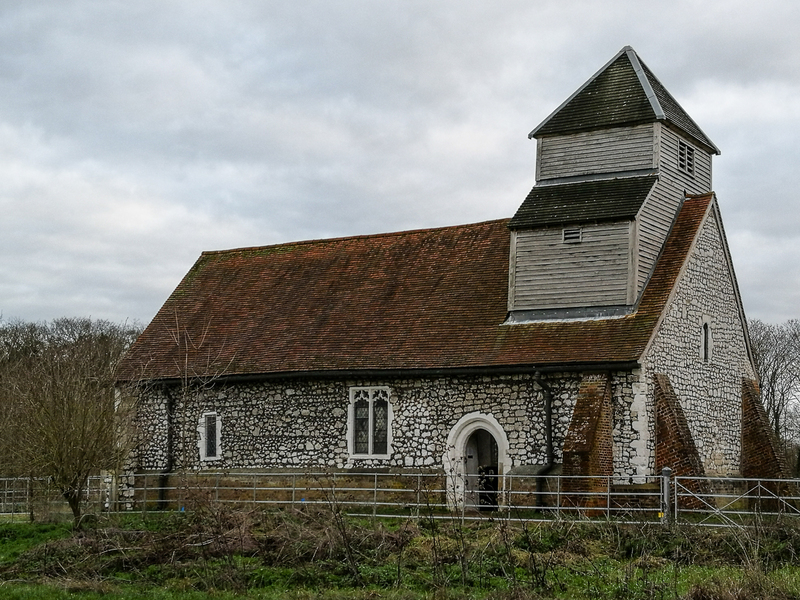 Lastly, depending on the weather, a small group of us may be out surveying at Ashwell Church this Sunday. 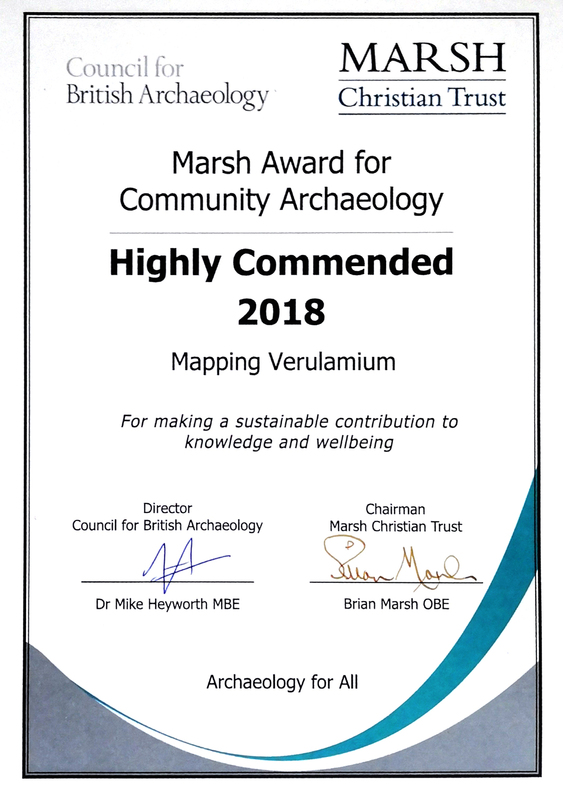 This entry was posted in general, Verulamium and tagged ahrc, CAGG, CBA, community archaeology, Marsh Awards, Near Surface Geophysics Group, NSGG, SEAHA, ucl, Verulamium on December 1, 2018 by hertsgeosurvey.